From December 29th – 31st – MorningStar’s New Year’s Conference was an overwhelming event that blessed many who attended and countless others who watched it from around the world on live-streaming. In straightforward unrehearsed unity, each speaker discussed the apathy found in most of today’s churches, the relentless turmoil around the world and their shared belief that we are living in the biblical times relating to the Lord’s return. In keeping with these messages, Rick Joyner believes that it is not too late for America to turn back to God and often quotes the Scripture which says, “Then if MY people who are called by my name will humble themselves and pray and seek my face and TURN from their wicked ways, I will hear from heaven and will forgive their sins and restore their land.” 2 Chronicles 14. One speaker pointed out that Christians are slowly but surely being marginalized in America as extremists. The reality is that a person would have to make a concerted effort to not recognize the steady removal of God from our culture and the growing negative attitudes toward believers. 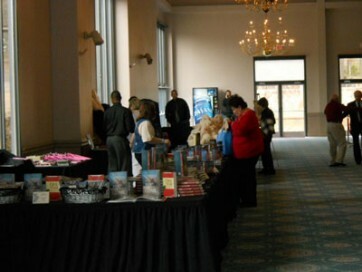 The conference can be purchased through MorningStar Ministries at: www.morningstarministries.org. Lt. General Boykin, who was one of the original members of the U.S. Army’s Delta Force, commanded the U.S. Army’s Green Berets and is an ordained minister, went into great detail of what to expect both at home and abroad in the coming year. His knowledge of the dangers facing Israel caused many conference goers to recognize how close war really is in that region of the world. At the conference, MorningStar’s Missions Director, Jorge Parrott, described a few of the many operations that MorningStar/CM Missions are involved in around the world. MorningStar missionaries empower native leaders, establish and equip strategic command centers worldwide, stop human trafficking in many nations, sponsor orphans in Christian education, and are involved in extremely dangerous covert missions. 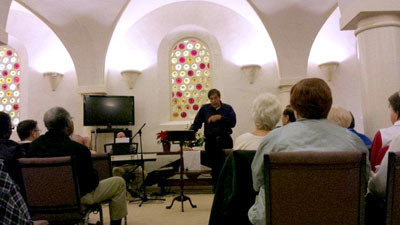 The Upper Room: The New Year’s Eve Candlelight & Communion Service held in the Upper Room by Russell James and Bishop Ron Lambright was filled with the presence of the Lord. The holy, peaceful atmosphere in the restored building is a sign of God’s ability to change the impossible to the attainable. Under the leadership of Bishop Lambright, the faith-filled Prayer Team continues getting good reports from the many prayer requests they receive. The Upper Room is open every Thursday from 6:30 to 8:00 p.m., Saturday from 9 a.m. to 7 p.m., and Sunday from 1:00 p.m. to 6:30 p.m. Additionally, for the past few months Bishop Lambright has been holding Sunday morning church services at 11 a.m. in the upstairs chamber – EVERYONE IS WELCOME. God Bless Bishop Lambright in all that he does to serve God’s people. 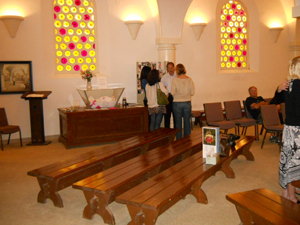 If you have a chance to visit the Upper Room, it will be a moving experience that will not be easily forgotten. Special Note: Unfortunately, there are some ministries on the grounds that are struggling. The Upper Room is no exception. Russell James plans to continue maintaining and improving the historic building, but every so often he needs financial support. “Occasionally I have to do some very difficult things in my life and this is one of them. I find it difficult to ask people for money, but the Upper Room is in need of some financial help. 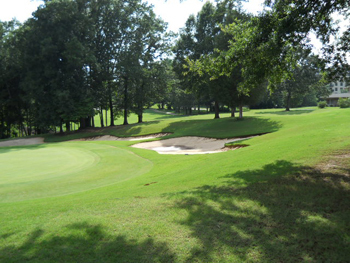 I have been encouraged by a few people to let the folks who love this place so much to have a part in helping. So here it goes. The Upper Room has never had insulation put in the attic area of the building and now that it’s winter we find that the heating unit is running a lot more, costing more to operate the building. We also have to put in a sidewalk extension for safety reasons. We do not want anyone to fall and hurt themselves. 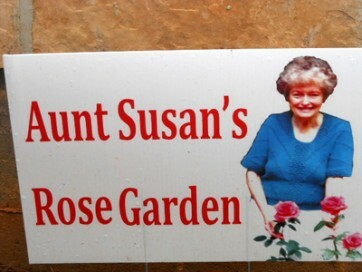 At our second year celebration of the reopening of the Upper Room December 1st, we announced that we were going to start the ‘Aunt Susan’ Rose garden in the spring. 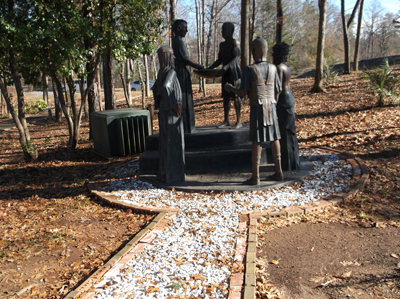 This is a tribute to Aunt Susan and Uncle Henry who were such an important part of the Upper Room in its early history. 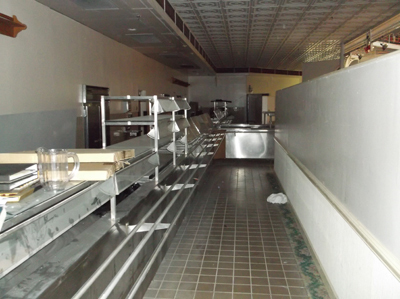 What we have to do is raise $5,000.00 dollars to complete all these projects. We are asking twenty people to give $250 specifically for this endeavor. 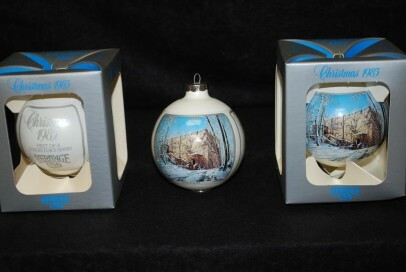 We were given yesterday twenty-one of the original 1983 Heritage USA Christmas ornaments. They are in mint condition and in the original box. Just take a look at the picture. 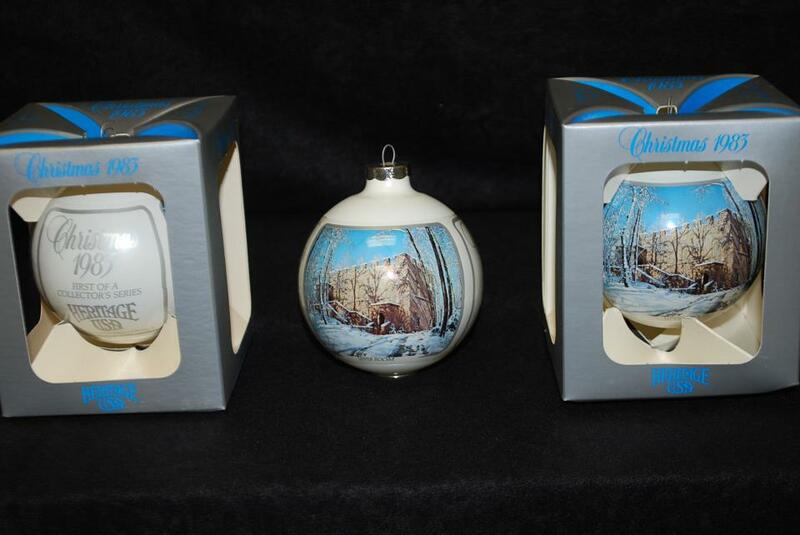 As a gift to you for helping in this project we would like to send you one of these beautiful keepsakes in hopes that it will remind you to pray for us as we pray for you. Please don’t do this because I am asking but only if the Holy Spirit directs you. And please forgive me for asking for money, I just hate to do it, but at this time we just do not have the means to get these projects done. You can mail your gift to the Upper Room, 8409 Regent Parkway, Fort Mill, SC 29715 or go to the website, www.upperroomchapel.com, and click on the Support page. There you can use the secure Pay Pal account to send it. PTL’s Susie Moppet Dolls: During the month, several new Susie Moppet dolls from the PTL days were donated to the Upper Room. They are in excellent condition and in the original PTL boxes, plus each doll features encouraging little messages recorded by Tammy Faye. The Susie Moppet doll was one of the more popular items offered by the PTL Ministry in the mid eighties and has recently been offered on-line by private owners for as much as $500. For a $100 donation to help with the upkeep of the Upper Room, you can receive a doll as a “Thank You” gift. For further information go to their facebook page at: http://www.facebook.com/groups/62147692320/ or contact Russell James through the Upper Room Chapel’s website: www.upperroomchapel.com. 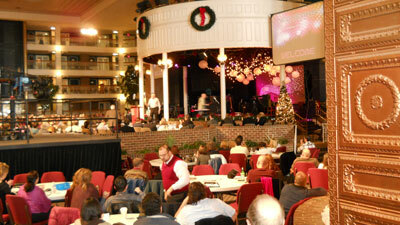 The Towers: Rick Joyner mentioned at the New Year’s Conference that it is time to finish the Towers. In an interview that CN2 News did with York County Manager Jim Baker, it was reported that Mr. Baker says the Towers’ situation could be resolved between MorningStar and York County during the first quarter of 2013. Also, during a recent Sunday morning service at MorningStar Dave Yarnes, Executive Vice President of MorningStar Ministries, said the ministry’s goal for this year will be to “push forward” to finish the Towers. Then on Thursday the 24th, our local paper The Herald reported that MorningStar Ministries has filed a lawsuit against York County concerning the redevelopment of its Heritage Towers project. After much mediation, the project has once again come to a grinding halt. The Castle and Possible purchase of more property: MorningStar Ministries also announced that the Castle is unsalvageable and will be taken down soon. Time has taken its toll on the building to the point that it is now beyond repair. The Castle was to be the largest Wendy’s fast-food restaurant in the world back in 1986. It was also announced that MorningStar Ministries is looking to purchase the area adjacent to them where PTL’s former Campgrounds Registration Office and Wagon Wheel Restaurant are located. 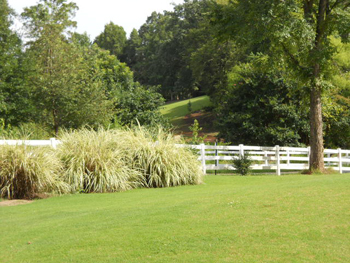 The property consists of 23+ acres and has been on the market for a few years. The Jubilee Life Center Church currently rents the buildings. More New Homes on the Grounds: For the past several weeks the land in front of the Castle, where the Heritage Island Water Park once stood, is being developed by Coulston Enterprises to make room for even more new homes. It’s sad, really, to watch bulldozers continually reconfigure the grounds. Though the former Heritage USA landscape has radically changed, there are many ministries that have moved here over the past few years. Church goers and church leaders alike continue to pray for a revival, both on the grounds and in our country. Keep in mind, the world changed forever on the Day of Pentecost when 120 men inside the Upper Room in Jerusalem came into agreement and they then received POWER from Heaven that eventually turned the world upside down. A Tour of Heritage USA is available at Ben Martin’s unique interactive website: www.heritage-usa.org. Experience a nostalgic walk down Memory Lane, and be delighted with the ingenious way Ben put together this site that takes you back in time to experience Heritage USA. 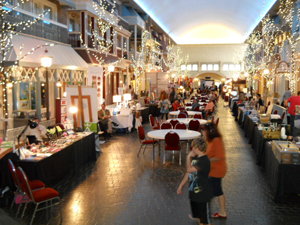 The Heritage USA Museum is located off Main Street inside the Heritage Grand Hotel. This excellent project was started by Ben Martin and Clint Rogers a few years ago. 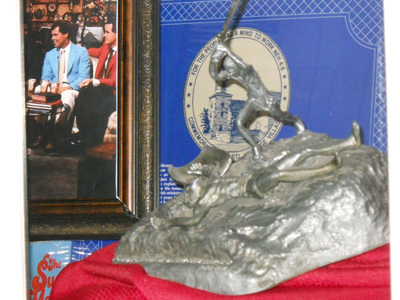 Donors, including Pastor Jim Bakker, have given some of their personal possessions to the museum. Someday they hope to have a larger facility to house everything they are collecting that will show the history of the entire PTL Ministry. During the month, on the Jim Bakker Show, Pastor Jim continued speaking out about the church’s need to prepare spiritually and physically for the days ahead. The Lord spoke to him that 2013 would be like it was in the days of Noah. Noah was mocked for obeying God and preaching righteousness as he warned people to turn back to God because it was going to rain. At the time no one had ever seen rain. He was ridiculed for over 100 years right up until he and his family entered the Ark and it started to rain for the very first time, causing the flood that covered the earth. “Jim Bakker spoke of a dream where he saw the ugliest demons he had ever looked upon during the recent holiday season. God told him what he saw was the ‘hordes of hell.’ Rick Joyner had a vision in 1995 of the horde marching out of the bottomless pit. The marching orders for this army are to cause division, Joyner explained, This horde was sent to attack at every level of relationship, between churches, congregations, pastors, husbands and wives, children and parents, and even children with each other. The advance scouts were sent to locate the opening that could be exploited and made into larger breeches for the larger divisions of demons that were yet to come. If the evil- one can cause division, he can divide and conquer. Together and in one accord, the Spirit of God can work and we are stronger. People were disobedient, the longsuffering of God awaited to execute His righteous judgment in the days of Noah, while the ark was being prepared. The Lord God is waiting for the wicked to repent and His people to prepare for the tribulation time ahead. This is a test of faith. There is a reason why Jesus told us what is to come and is giving us signs to herald the coming of our Bridegroom. The evil in this world must really be testing the patience and longsuffering of the All Powerful Lord God, just as it was in the days of Noah. Christian persecution is on the rise. The enemies of Israel surround her and are attempting to divide Jerusalem. The world economy is crashing. Everywhere we look we see wars and rumors of more wars. Man is developing new ways to create mass murder with bigger and better weapons. It seems that from day-to-day, we don’t know if a massive storm will strike us or an EMP bomb will explode over us. We struggle against cyber-warfare, hunger, rising food prices and pestilences that come in many different forms. Earthquakes are occurring in diverse places and we live under the threat of solar storms and falling stars, yet we will not turn from our wicked ways and repent. All hell is about to break loose from the pit and most of what we call God’s church is ill prepared to handle the spiritual warfare or physical needs. Half of our population does not even acknowledge or understand the spiritual realities all around us. They think that if it is not physical, it is not real and they do not have to deal with it, or let someone else fight against these vile spirits. We are in a battle for our mind, and some of us are losing the battle. We listen to the wrong spirits whispering in our ears and entertain thoughts that will lead us to destruction and separate us from God. The pressures and tribulation of this world push in on us, but we need to know that our mind is like a radio station. Don’t tune into the wrong station. Don’t listen to all the static. Out of the abundance of your heart the mouth speaks. It is like the old saying ‘put good things in – get good things out!’ The Scriptures say if you want to enjoy life and see many happy days, keep your tongue from speaking evil and your lips from saying things that are not true. The hordes of hell will not be able to stand against the weapons of our warfare because the weapons of our warfare are not carnal, but mighty through God for the pulling down of strongholds. Tammy Sue hosts a live-streamed Internet program from Grace Street at Morningside Ministries in Blue Eye, Missouri. 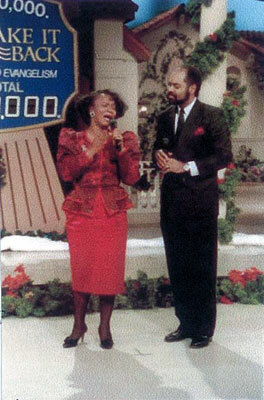 It’s on each weekday from 10:30 a.m. – 12:30 p.m. (CST) unless there is a taping of the Jim Bakker Show. The No Show Show is an encouraging time of sharing, prayer, music and anointed worship songs by Tammy Sue and the Morningside Band. Whether you watch it for a few minutes or in its entirety, the No Show Show is an inspirational break from the day-to-day tensions life brings. To watch the show, click on the “Watch Us” tab on Morningside’s website at: www.jimbakkershow.com. The No Show Show also has a facebook page at: https://www.facebook.com/noshow.show. 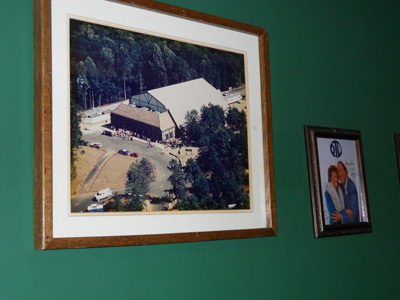 A look back: Twenty-five years ago there was a New Year’s Eve Celebration held in the Barn Auditorium at Heritage USA that we attended. It’s hard to believe the events that have taken place on the grounds since that night when Jim & Tammy Faye Bakker were there as the leaders of the PTL Ministry. According to the National Climatic Data Center in Ashville, N.C., America set an off- the-charts heat record in 2012, making it the hottest year on record. On the 31st of December, Yahoo! News (Space.com) reported “Sun rings in New Year with Solar Eruption” – As people around the world rung in the New Year to celebrate Earth’s latest trip around the sun Monday night, our closest star marked the occasion with some fireworks of its own – a dazzling solar eruption. 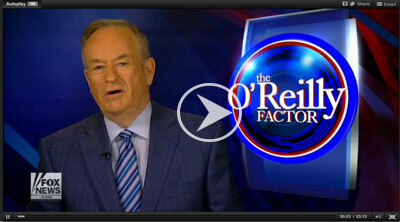 During the month, Bill O’Reillly of Fox News gave this powerful warning about America. Click on below video to watch. On the 21st, at the Presidential Inaugural Prayer Breakfast in Washington D.C., Rabbi Jonathan Cahn, author of the 2012 best seller THE HARBINGER, was privileged to give the Keynote address. This was an eye-opening moment for those who did not know about the mystery the Bible holds concerning America’s future. As the Rabbi explained what will happen to a nation that once knew God and then departs from His ways, Jonathan Cahn delivered a powerful message to Washington D.C. at just the right time. The following video is a must see. SPECIAL NOTICE: JIM BAKKER AND THE STUDENTS FROM THE MASTER’S MEDIA SCHOOL WILL BE VISITING HERITAGE USA THE LAST WEEK OF FEBRUARY. 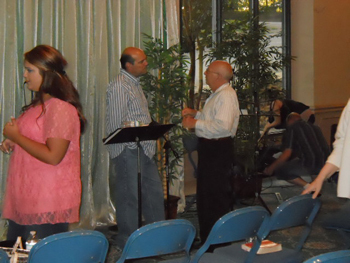 PASTOR JIM WILL HOLD A RESTORATION SERVICE IN THE UPPER ROOM, AND WILL ALSO TELEVISE A PROGRAM FROM THE TV STUDIO. THIS IS THE FIRST TIME HE WILL BE DOING A SHOW ON THE GROUNDS SINCE JANUARY 2nd 1987! The Towers: As the bricks are falling off the facade of the building, there appears to be no end in sight to solving the Towers’ situation. Last month, MorningStar Ministries filed a lawsuit against York County blaming them for the failure of the Towers’ completion. Whoever is to blame, the fate of the deteriorating building will have to wait until all legal litigation is settled. A lawsuit could possibly take a few years to get through the court system and, as it now stands, the only common ground some of the residents on both sides of the issue have is a shared disappointment over yet another delay. More than a quarter century has passed since the Towers was in the final stages of completion and over those years many sincere people, ministries and organizations made plans to complete the 21-story building, all to no avail. 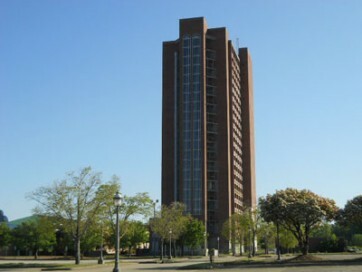 Unfortunately, the Towers is the tallest building on the grounds and can be seen by everyone living in and around the surrounding area. This situation probably ranks high among the bizarre dilemmas that York County has dealt with. As we’ve written time and again, the late Pastor David Wilkerson’s prophetic word concerning the Towers still holds true. Rick and I understand some of the frustrations being generated over the unfinished Towers. Realistically, the building should have been completed by now. To be fair to Rick Joyner, it isn’t necessarily his fault. Looking at the problem from a spiritual perspective, there may be deeper reasons why the Towers is not completed and why birds continually fly in and out of the openings on the top floors. 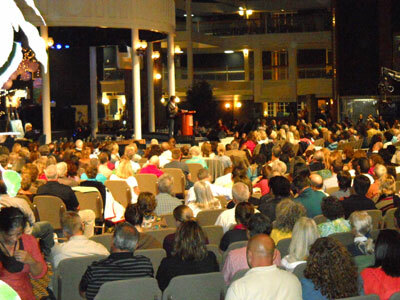 In 1986, when the Towers was just a few months away from completion, David Wilkerson, Pastor of Times Square Church in New York City, (www.tscnyc.org) saw that the PTL Ministry had moved from the “Spirit” into the “Flesh,” and its message started leaning toward a “Prosperity Gospel.” While Heritage USA was exploding with success, Pastor Wilkerson openly voiced his objections of the prosperity message and prophesied that as a result of PTL losing its original vision, the Towers would not be completed as planned. He proclaimed that birds would be flying in and out of it until the ministry changed course. At the time, David Wilkerson’s words seemed absurd because in 1986 six-million people visited Heritage USA. However, two decades later his words have become haunting! The simple truth is only God has control over when or if the Towers will be completed. Long after Jim Bakker left PTL, he said that Heritage USA had turned into a “monster,” which caused him to have to raise $1 million every two days just to keep it alive! 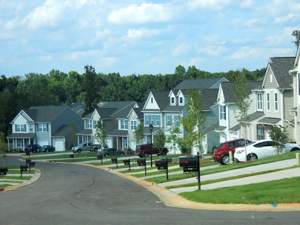 If Rick Joyner and Earl Coulston had not moved on the grounds in 2004, a large part of Heritage would not have been refurbished and many of the new subdivisions would not exist. Though a full restoration of the grounds hasn’t happened, there have been some improvements made to its overall appearance because of these two men. On the other hand, it is disappointing for the people and families who moved here since 2004 that were promised a shopping mall, restaurants, pristine parks and the removal of the Towers to not see the fulfillment of those promises. During the month, Jim Bakker announced some miraculous news about the 15,000 hours of video tapes from the original PTL Shows. The entire PTL library of videos was auctioned off a few years ago after the church they were being stored in for over twenty years ran into financial problems. Additionally, there has been another 5,000 hours of PTL shows that were recently recovered. 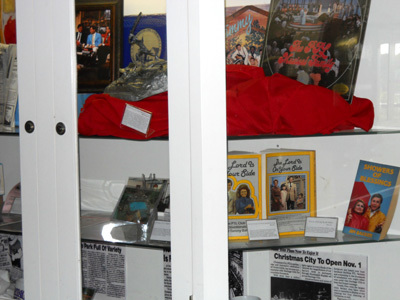 The entire library was purchased by the Shrine of the Holy Spirit Chapel in Branson, Missouri. As it turns out, the Assemblies of God denomination that Jim Bakker was ordained by now has the entire PTL Library and they have since reached out to him. They apologized for not standing with him twenty-five years ago when his world came apart, and have consulted with him over restoring the entire video library of the PTL shows. With over 20,000 hours of PTL programs to be digitally re-mastered, the restoration project is daunting. 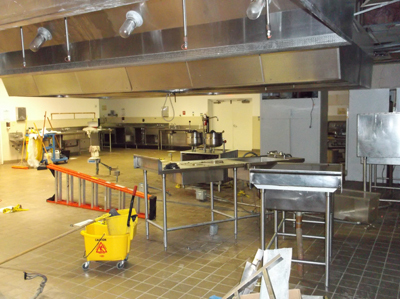 The Assemblies of God needed help in this huge undertaking because it is both costly and time consuming. 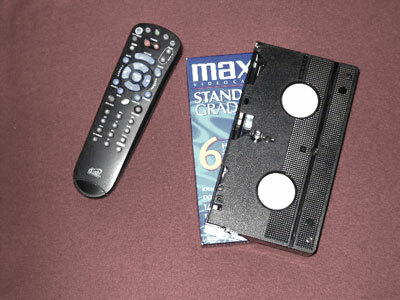 The restoration of one PTL Program alone can take from 35 to 38 hours to re-master. Pastor Jim and the Assembly of God church made an arrangement whereby Pastor Jim will help with the whole restoration project and have full access to his life’s work. Miraculously, he will now be able to offer the original PTL shows to the public. For information on this amazing breakthrough and how you can order the PTL Shows for a love gift, contact the Jim Bakker Show at www.jimbakkershow.com or call 1-888-988-1588. There was also some mention that the shows could end up on TV – much like the old “I Love Lucy” programs that have been broadcasting around the world for over fifty years! Moreover, back in the day the PTL programs brought the Gospel to a worldwide television audience resulting in multiplied millions coming to the saving knowledge of Jesus Christ. Without a doubt if these shows were aired, the same anointing that won millions of lost people to the Lord so long ago would happen again because the videos will never lose their anointing. Praise the Lord for this miracle! On the 11th, Pastor Jim & Lori Bakker appeared on the Marcus and Joni Show on the Daystar Christian Network. Pastor Jim was promoting his new book Time Has Come and he talked about it and the Revelation days we are living in. He also reminisced about bygone days at Heritage USA. Without the pressures of being bombarded with questions about the past, coupled with Marcus and Joni Lamb’s caring friendship that dates back to the PTL days, Jim Bakker appeared more stress-free and confident than he has in quite a while. Marcus and Joni honored him in such a considerate way that the viewing audience actually got a glimpse of the Jim Bakker from years past! There was a restoration of joy and confidence in his persona that melted away the incredible struggles he has survived since 1987. The Lambs are definitely people who recognize the importance of restoration and God’s anointing on Jim Bakker’s life. For their appreciation for all that Jim Bakker accomplished in serving the Lord through Christian TV, Daystar donated $10,000 to Morningside Ministries for the completion of Lori’s House to save the unborn. 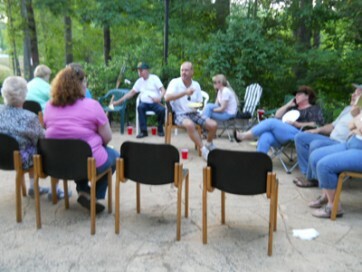 Without a doubt, both Jim and Lori enjoyed the welcoming atmosphere and the kindness with which they were regarded. Lori and I wanted to let you know that we are going to meet at Heritage USA, now known as Heritage International, with Rick Joyner and many of the prophets for the Annual Round Table. This is a meeting to hear from those who are hearing from God and to find out what God is speaking to his leaders. We will be sharing some of their message over television in the next few weeks. Cindy Jacobs, who will be at the round table, said to us that she felt God would have us originate our television program from the Upper Room, which has recently been restored and reopened. We have just completed the plans to make this event take place and we are bringing our total student body and many of our ministry staff including Kevin Shorey for this epic reunion. Not only will that meeting take place in the upper room but we will also have many prayer and communion services over a three-day period. Over the years I have seen more miracles take place in the Upper Room than in any other place. Something so exciting is happening on our last two days of this Restoration Celebration – our program will originate in our former studio that also has been beautifully restored. 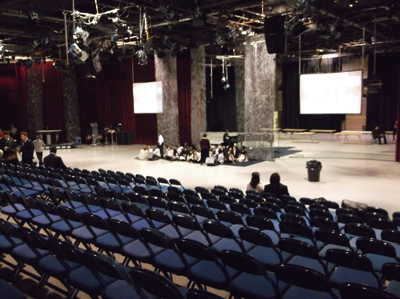 This will be the first time I have originated my program from our former studio home at Heritage USA. Rick Joyner and other prophets will be my guest for this Restoration Celebration. Cindy Jacobs says she has messages for and plans to pray for many of our viewers and former and present staff at this event. This will be a historic event that I know many of our regular viewers and friends will want to join us for at Heritage International. Because of limited space, these tapings are limited to our regular viewers of the Jim Bakker Show. This letter is all you need to have with you for entrance to this event, or just give your name at the door and we have your information as one of our partners. The dates are February 27, 28 and March 1. The tapings on February 27, are planned to take place in the Upper Room beginning at around 11 AM with very limited seating. The Jim Bakker Show tapings will take place on February 28 and March 1 at around 11 AM in our former studio at Heritage! While you are at Heritage be sure to take a tour to see, not only the Upper Room, but the restored Big Barn Auditorium and restored studio that Dale Hill and his team have recently rebuilt – as well as The Grand Partner Center restored by Rick Joyner and his wonderful partners! 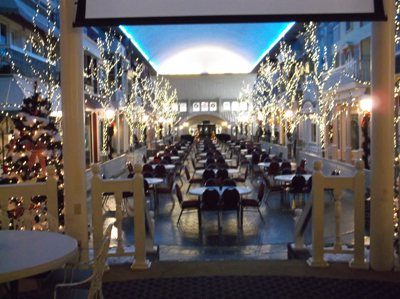 If you want information regarding the rooms at the beautiful Heritage Grand please call 877-446-3836. I am sorry for the late information but the plans for all of these events have just taken place. Don’t feel bad if you cannot make it to this event as most of it will be televised and we hope to do a major reunion at some future date at Heritage. This is your time for all to be restored to you just as God is doing this restoring miracle for us! 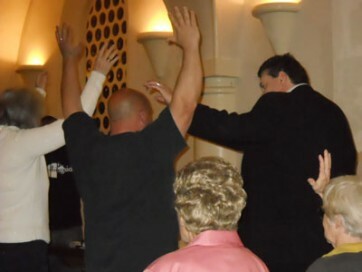 From Monday the 25th through Friday March 1st, the Upper Room was filled each evening with expectations of healings and miracles as Evangelist/Singer Kevin Shorey conducted Healing Services. Kevin is a regular on the Jim Bakker Show and was one of the original Heritage Singers at PTL as a teenager. He has since become a full-time Evangelist traveling around the country as well as singing and ministering on Jim’s show. Before starting the first service, Kevin became very emotional and moved to tears as he told everyone there how thrilled he was to be back at Heritage USA where he started his ministry over thirty years ago in the Upper Room! At the services, Kevin prayed for everyone needing a miracle. 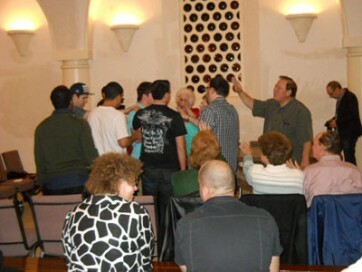 Pastor Jim also asked that he anoint and pray for each of the Morningside media students that were there. 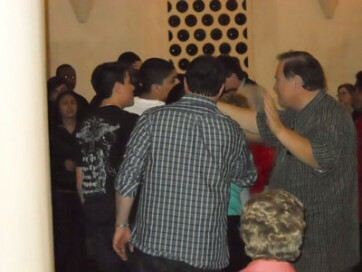 Four people were healed on the first night, with more good reports on the way. These were truly rare and beautiful miracle services that continued all week. Note: Check the Upper Room’s facebook page for pictures of the Restoration Service Pastor Jim held in the Upper Room on the morning of the 27th. 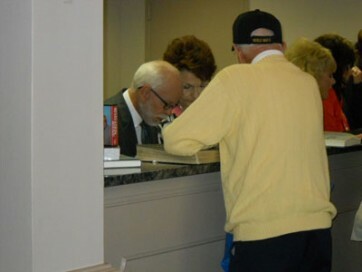 Morningside Ministries has been posting daily blogs and pictures of their visit to Heritage USA at: http://www.jimbakkershow.com. Click on the below photo albums for slideshow of a few miraculous moments held at the Upper Room Healing Services and the PTL TV Studio during Jim Bakker’s visit. All the shows will air on the Jim Bakker Show at www.jimbakkershow.com, and DVDs of this historic week at Heritage USA will soon become available from Morningside Ministries. At the end of the last show in the TV Studio on Friday, Jim Bakker thanked everyone who came out to see him and then he sadly said goodbye, stating he would not be coming back. One prophetic person in the audience later said, it is Friday, but Sunday is coming! On the 22nd, Fox News reported: Imprisoned American says Iranian captors ‘waiting for me to deny Christ’. American pastor Saeed Abedini, jailed in a notoriously brutal Iranian prison for his Christian faith, is facing physical and psychological torture at the hands of captors demanding he renounce his beliefs according to supporters. “This is a day that will go down in history as the Jim Bakker Show was broadcast live from the Upper Room at Heritage International for the first time in over 25 years. 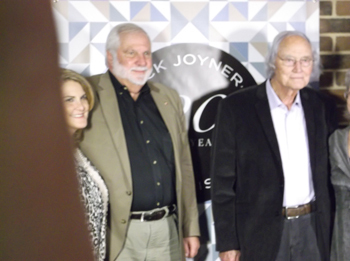 Jim honored Rick Joyner as one who has helped in his own restoration and has restored more people in the Body of Christ ‘than anybody else I know.’ ‘There is no one who is beyond the restoration of Jesus,’ Rick Joyner said during the show’s taping. He continued to speak about the power of restoration that has come to so many as the Upper Room itself was restored into service as a house of the Lord. 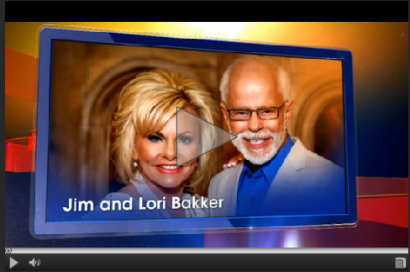 Click on below u-tube video to view highlights of Jim Bakker’s Homecoming. For the first time in more than 25 years, Jim Bakker is broadcasting his television program today from the studios of the former Heritage USA. 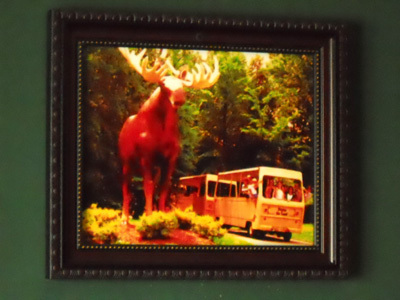 These days, the former head of Heritage USA, a Christian Theme Park that included TV studios as well as a “Main Street” with shops and other attractions, typically broadcasts his show from Missouri. But he returned to Fort Mill this week for “Restoration Celebration,” a series of broadcasts from his former stomping grounds. Events earlier this week have been by invitation only, but according to jimbakkershow.com, today’s broadcast will be streamed live on the website beginning at 10:30 a.m. from the former Heritage USA studios. This week, Bakker has also recorded his show from The Barn and at the Upper Room at the former Heritage USA site. Cathy McGee of Greensboro brought her mother Hazel Poe to the Upper Room Wednesday for a live broadcast of the show. Poe was a former supporter of PTL and still supports Bakker’s ministry in Missouri. She received an invitation by mail to attend, and ‘she said, ‘We have to go!’” McGee said. According to the website, Bakker was joined at the Upper Room by Rick Joyner, head of MorningStar Ministries and Cindy Jacobs whom Bakker refers to as a “prophet,” and Sara Morgan, the first person to buy a house on the Heritage PTL property. 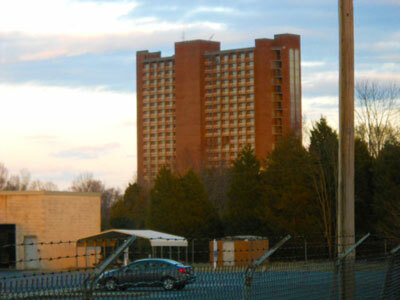 MorningStar Ministries acquired much of the former Heritage USA property, including Bakker’s unfinished tower that is now a bone of contention with York County. 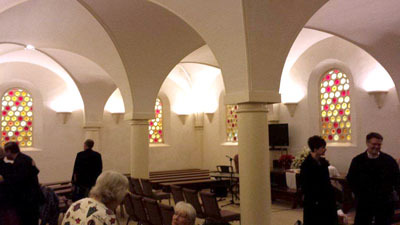 The Upper Room was originally opened by Bakker in the 1980s. It was designed to replicate the Upper Room – the place where Jesus is said to have had his last supper with his disciples – and functioned as a 24- hour prayer center, with a bank of prayer phones manned around the clock. It was renovated and reopened in December 2010. “Jim, you were the father of the ministry that remains on this property. There’s a heritage here and we think you were a great Father and we are honored to have you back here,” Joyner said during the broadcast at the Upper Room on Wednesday, according to Bakker’s website. “There is no one who is beyond the restoration of Jesus,” he said. Heritage USA and Bakker were immersed in scandal, which led to the eventual downfall of both. Bakker was discovered to have paid off then church secretary Jessica Hahn to cover up a sexual encounter and was later convicted on federal fraud charges. Bakker was released from prison in 1994. In addition to his religious message, Bakker’s current ministry also focuses on selling products, including vitamins, “Bread of Life” and Jim’s Favorite Soynut Butter. During the month, Jim Bakker’s return to Heritage USA drew more attention than he expected. The volume of messages and comments generated on facebook and other social media connected to PTL and Heritage USA was overwhelming. As usual, there were malicious comments made about his return as well. 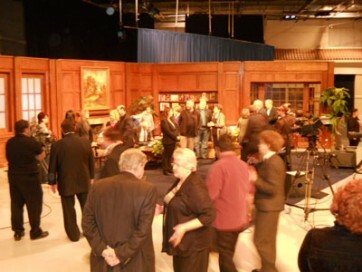 But they paled in comparison to the tremendous outpouring of support from thousands of viewers who watched the taped shows from the Upper Room and PTL TV Studio when the Restoration Celebration aired on the Jim Bakker Show. Along with the joyous moments of his homecoming, there were some serious times during the broadcasts when Jim Bakker shared his heart about the horrific experience of losing PTL. 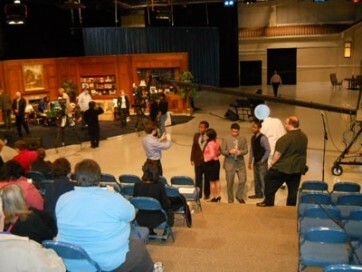 At one of the show’s tapings inside the TV Studio, Pastor Jim actually revealed startling details about the 1987 takeover of Heritage USA, stating he will edit them out of the show that will air on TV. He made it known that this information will only be released upon his death. The Lord told him years ago that if he tried to vindicate himself he would not preach again. He has since prayed for the people “in the know” to come forward and tell the truth of what led up to his sudden resignation from the PTL Ministry. Quoting from Proverbs he said, “Any story sounds true until someone tells the other side.” Vindication from all the courtroom lies that were told at his 1989 trial would be a miraculous vindication for Jim Bakker and everyone else who was devastated by the loss of the PTL Ministry and Heritage USA. When Pastor Jim reflected on the “violent loss” of his ministry, he clearly carried a deep heartbreak that has not fully healed. He told the audience that the hostile takeover of the PTL Ministry could have been avoided if only the church had “circled the wagons.” Sadly, there are people to this day who know exactly how his downfall was planned and yet they remain silent. Because the full story has been covered up, the stigma of the Bakker name continues to follow him, his children and his grandchildren. Jim Bakker failed morally, made mistakes, and trusted the wrong people. Even so, he did not mislead people, steal money nor did he commit the countless transgressions he was accused of by the media and his enemies. March 19th marked the 26th anniversary since Jim Bakker resigned from the PTL Ministry and was thereafter defrocked by his denomination. Only a few people know that he was found “not guilty” of defrauding anyone by a Federal Jury at a second trial that was held in 1996. By then, many said that it was too late for him to return – but God was with him. Although his new ministry in Blue Eye, Missouri is reaching the same amount of people as did the PTL Satellite Network, there are still those inside and outside the church that shun the Bakker name. Sooner or later the truth about the takeover of Heritage USA will surface as Isaiah 54:17 promises. It would be so much better if those who are holding on to vital information that would exonerate Jim Bakker to come forward, while he is alive, to once and for all set the record straight. When the entire PTL story is revealed, a tremendous injustice will finally be rectified. More Homes on the Grounds? 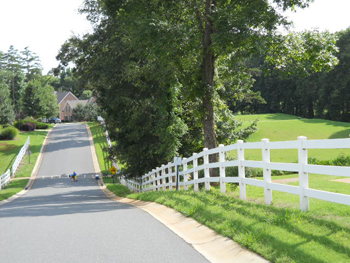 – This month a rezoning sign was placed on the corner of Regent Parkway and Star Light Drive by the York County Zoning Department. Earl Coulston is requesting a zoning change on 11.5 acres at the end of the main parking lot at the Heritage Grand Hotel. This property is bordered by Regent Parkway, Star Light Drive and Zenith Avenue. The request is to change the property from “PD” to “BD-11” status, meaning the land can now be used for building. 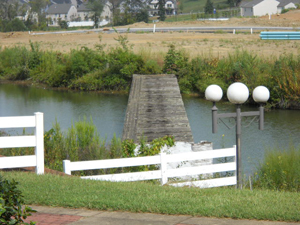 Permitted uses (some of which may require site plan approval) within the BD11 zoning district include: churches; commercial parking lots; lodges and civic clubs; museums, art galleries, and libraries; professional uses; and multi-family dwellings to include townhouses, apartment buildings, and condominiums. (For more detailed information, please refer to York County Zoning Code 155.135 & 155.136.) It has yet to be announced what will be built on the land. On the 19th, demolition started on the old Castle and was stopped that afternoon by York County and DHEC because Earl Coulston did not have the proper demolition permits. It will be torn down completely as soon as permits are issued. FORT MILL – The two story castle in Regent Park that has served as a landmark and a community conversation piece for more than 20 years is being demolished. But before the building could be torn down Tuesday afternoon, York County officials made crews stop work. 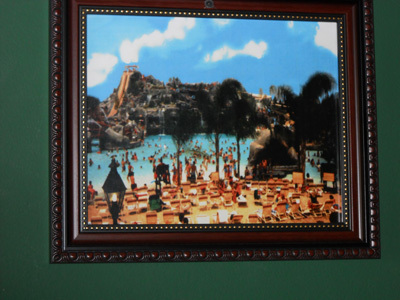 Once known as “Kings Castle,” the castle was part of the Heritage USA theme park, and later the water park, that attracted visitors to Fort Mill from around the country. 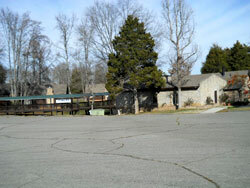 The property is owned by MorningStar Ministries. The castle hadn’t been in use since at least the 1990’s. Joyner said that MorningStar considered refurbishing it but didn’t think that would be cost effective. Among the ideas being considered for the area are a dog park, he added. 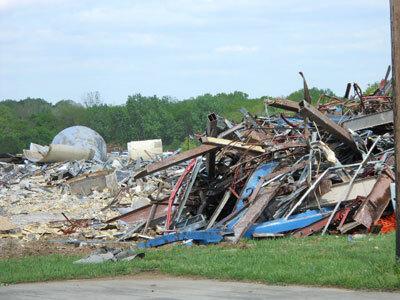 Crews began the demolition Tuesday morning but work was shut down around 4 p.m. when county officials put a large, red ‘stop work’ sign on the property. A demolition permit is required by the South Carolina Department of Health and Environmental Control, however DHEC had no records of a permit being filed in York County for any demolition work between March 1 to April 15. “York County was first on the scene but DHEC has also been out there and we’re told they (MorningStar) would take the necessary steps to be in compliance,” said DHEC spokeswoman Lindsey Evans. A MorningStar media relations official said Joyner would not answer any questions about the demolition permit. MorningStar filed against York County in January to dispute the county’s claim that the organization defaulted on an agreement to renovate its 21-story Heritage USA tower. 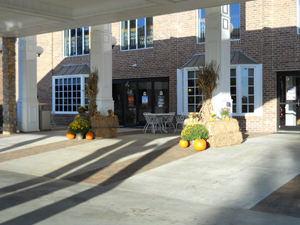 In 2007, MorningStar began renovating the tower and in January 2008 signed a development agreement with York County. The ministry says the county’s default notice has “caused significant financial harm,” making it almost impossible to renovate the unfinished tower. The two parties tried mediation but could not come to terms. As of earlier this month, the county had not yet filed an answer to MorningStar’s suit but planned to file for an extension to the answer period deadline. York County’s attorney could not be reached late Tuesday afternoon. 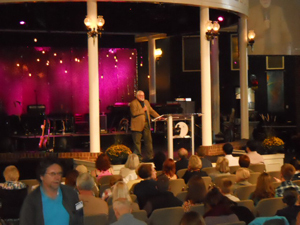 From the 21st – 23rd, MorningStar Ministries held their annual Healing Conference. This year’s conference was a little different because MorningStar brought in speakers, from different denominations and countries, who were virtually unknown in America. One of the most amazing speakers at the conference was Father Marc Van Rossem from Holland. This gifted Catholic priest brought a level of peace and healing to the conference that literally surpassed understanding. Much like the atmosphere found in the Upper Room, the lobby of the Heritage Grand became a sanctuary filled with the presence of God. It was transforming to experience the great peace Father Marc brought. During the month, we learned that in the span of one month Jim and Tammy Faye’s son Jamie Charles released his latest book Faith, Doubt, and Other Lines I’ve Crossed, remarried, and moved to Minneapolis, Minnesota. Jamie Charles, now known as Jay, has pastored Revolution Church NYC in Brooklyn, New York for the past six years. The New York church will continue on with Co-Pastor Vince Anderson, and will work on the direction they want to go, but Jay is branching out toward new opportunities. Jim Bakker and Jay differ on theology, but they love and respect each other. Easter Sunday March 31st – As the world grows darker and becomes more chaotic, it is a good time to remember what Jesus did for everyone on the cross. Our lives on earth are so very short compared to the everlasting life awaiting those who believe in the Lord. We have the great assurance in that on the cross Jesus Christ paid for all our sins, and made it possible for us to one day live in a whole new world where there will be no more tears, trials, persecution, sickness, loss, worry, poverty or pain. The Towers’ dilemma gets more complicated by the day. After all these years, residents on the grounds continue to openly voice their frustration over when or if the Towers’ will be finished or torn down. The latest news is that York County is now asking the State of South Carolina for an order to allow the demolition of the Towers with MorningStar Ministries being responsible for any costs that are incurred. In contrast, Rick Joyner remains firm that the Towers will be completed. FORT MILL – In a legal response filed Tuesday, York County maintains that MorningStar Ministries defaulted on a development agreement and asks that the organization’s tower in the Fort Mill area be demolished. 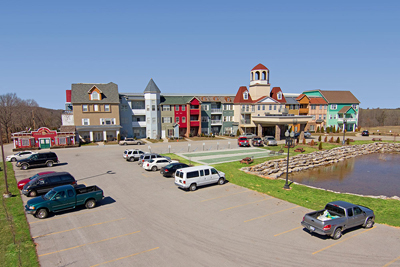 MorningStar filed a suit in late January against York County, disputing that it has defaulted on an agreement to renovate the tower – once intended to serve as a hotel in Jim and Tammy Faye Bakker’s Heritage USA religious resort and theme park. The county and MorningStar entered a development agreement in 2008 in a move to repair the tower. The tower is ‘remarkably sound from a structural and engineering standpoint,” MorningStar said in a news release in January. The county and some neighbors near the MorningStar property contend that the tower isn’t safe. Over the past few months, neighbors have taken their complaints to the York County Council about the organization’s road, saying the street is full of potholes. County officials have said they do not have jurisdiction to demand maintenance on private roads. MorningStar has allowed its property to fall into a condition that “substantially and unreasonably” interferes with “public health, safety, peace, comfort, (and) convenience,” according to York County’s suit. York County is renewing its efforts to demolish a stalled residential tower in Fort Mill that once was a part of the PTL Club Empire. 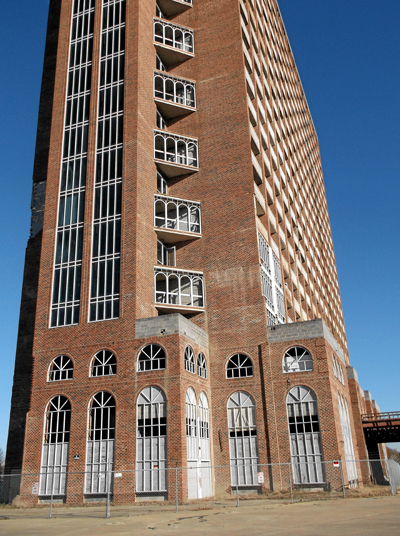 The county’s attorneys call the vacant and decaying tower a “nuisance” in an answer to MorningStar Ministries’ state court lawsuit filed in February. York County contends MorningStar violated a development agreement signed in 2008 that spelled out how MorningStar could renovate the tower in an estimated $40 million project. “As a result of MorningStar’s breach, York County seeks and is entitled to an order authorizing it to proceed with the demolition of the tower, and an award of damages in the amount of the cost incurred or to be incurred for its demolition,” the county’s answer states. 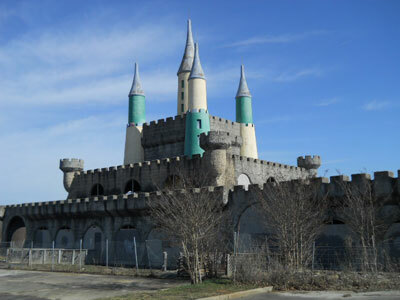 FORT MILL TOWNSHIP – One of the owners of the property where King’s Castle was built back in the Jim Bakker PTL era has applied for a permit to demolish the local landmark. 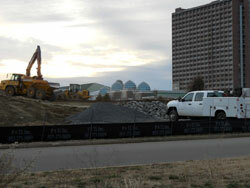 Local builder Earl Coulston of Regent Park developer Crown Homes submitted the applications to the S.C. Dept. Of Health and Environmental Control late Monday, an agency spokesperson said Wednesday. The iconic two-story King’s Castle, once slated to become the area’s largest Wendy’s restaurant, is on the campus of MorningStar Ministry near Regent Park. Another DHEC spokesman said on Monday that no one had applied for the permit and it was explained Wednesday that the permit was submitted close to the end of the day and did not show up in the agency’s system until the following day. 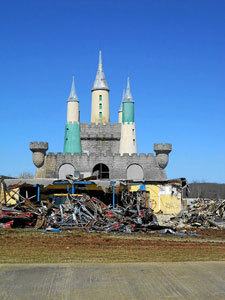 Coulston began taking the Castle down last week, but York County officials halted the work, citing the lack of a permit. DHEC spokesperson Lindsey Evans said if the permit is granted, the earliest demolition could resume is April 8. On April 20th, the Castle was finally taken down. WSOC-TV reported: Iconic castle in Regent Park now simply rubble, ashes- FORT MILL, S.C. – Ashes and rubble are all that is left of a historic castle in Fort Mill, S.C. The castle has stood in Regent Park for decades and people in the area told Eyewitness News that they are sad to see it go. 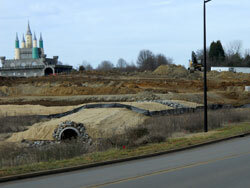 The rubble was once an iconic castle and part of Heritage USA. It has been a landmark in the community, and now it is being flattened by bulldozers. 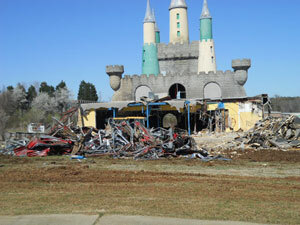 On the 23rd, Rick Joyner made a statement about the demolition of the castle. On the 25th, WCCB Charlotte TV reported: MorningStar Ministries in Fort Mill has filed for a protective order against York County. Court records reportedly show the religious organization is asking a judge to excuse it from having to provide financial documents to the county, or seal the documents so no one except attorneys in the case can see them. Reports say MorningStar filed a breach of contract suit against the county in January. The county disputes the claims and has subpoenaed MorningStar’s financial records from the last nine years. located by the old entrance to Heritage USA are filing a lawsuit against the current owners of the property: A news article published on the 8th by WRHI reported: “Residents in a condominium complex connected to former TV evangelist Jim Bakker and his PTL television network are now speaking out on a lawsuit against the current owners of the property they say is in need of repair. 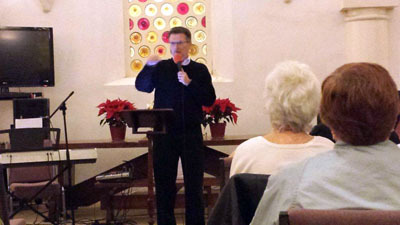 The Upper Room: Bishop Ron Lambright recently started a Wednesday night interactive Bible study on the “End Times” at the Upper Room. Gauging from the escalating instability in the world right now, more and more people are becoming interested in what the Bible has to say about the perilous times in which we live. During the month, Jim Bakker continued teaching on the end times, warning people to be prepared spiritually and physically because there will be many more calamities just ahead. He continually emphasizes to his viewers the importance of being prepared for the times of trouble which the Bible speaks about. One of the most important and confusing words in the Book of Revelation is the word “shortly,” found in Revelation 1:1. The word “shortly” gives the impression that the events described in the Book of Revelation will be happening soon. But that was written 2000 years ago, so people understandably become confused as soon as they start to read the Revelation. The following video bears repeating because Pastor Jim explains what the word “shortly” actually means in the Greek and Hebrew text, allowing the reader to understand that there really isn’t any confusion once you understand its meaning. To watch the Jim Bakker Shows from Morningside Ministries in Blue Eye, Missouri, click on the Jim Bakker Show at www.jimbakkershow.com. The shows are either live-streamed or can be found in the “Archives” section. For a complete listing of all the stations and channels that the Jim Bakker Show is on, click on the “Watch Us” tab on his website. Note: Rick Joyner will be a guest on the Jim Bakker Show on May 1st. The live taping can be watched on-line at 11a.m. CST. This program will air on TV at a later date. During the month, Former PTL Singer Sandy Hosey went to be with the Lord after a long battle with cancer. 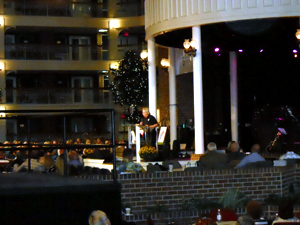 Sandy along with her husband Russ not only sang frequently on the PTL Club/Jim & Tammy Show, but also performed and ministered throughout the Heritage property. Russ Hosey also served as a pastor at the Heritage Village Church. 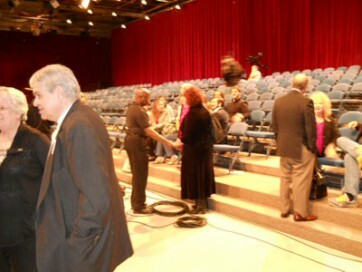 Sandy Hosey’s Memorial Service was held in the former PTL TV Studio at the Broadcast Group on April 26th. This gracious woman was a beautiful, humble servant of the Lord who will be greatly missed. Please say a prayer for the whole Hosey family as they mourn their loss. 1. Antioch International Church, pastored by Peter Wyns, is located in the industrial section just over the railroad tracks at 8180 Regent Parkway. www.lifeatantioch.org. 3. 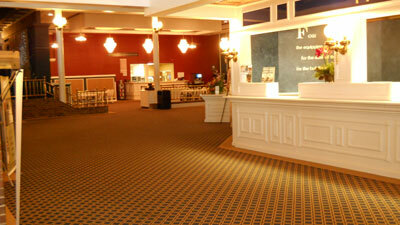 Fresh Fire USA, Evangelist Todd Bentley’s ministry office is located inside the Heritage Grand Hotel on Main Street. http://www.freshfireusa.com. 4. 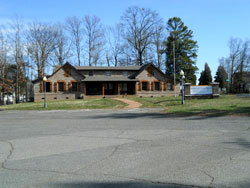 World Outreach Center & Community Church – directed by John and Joanne Cava is located at PTL’s former Welcome Center near the old entrance to Heritage. Information about this ministry can be found on their facebook page at: https://www.facebook.com/worldoutreachcenter. 5. Randy Hill Ministries – pastored by Randy Hill, who is part of The Broadcast Group, holds a Sunday night Praise & Worship Service at 6:30 p.m. in the former PTL TV Studio. www.randyhillministries.org. 6. 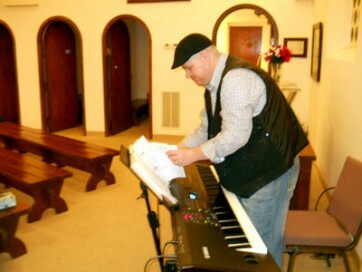 The Upper Room Chapel is owned and operated by Mr. Russell James. 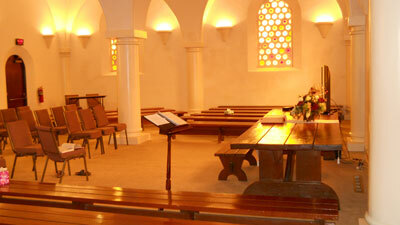 The chapel is open for prayer and meditation on Saturdays from 9 a.m. to 7 p.m., and Sundays from 1 p.m. to 6:30 p.m. There is also an 11 a.m. Church Service on Sundays conducted by Bishop Ron Lambright. ALL ARE WELCOME. For more information, check out their website at: www.upperroomchapel.com, or keep current with the happenings at the Upper Room on their facebook page at: https://www.facebook.com/groups/62147692320/. 7. The Barn Auditorium (Heritage Village Church) – The Broadcast Group has completed the work on the Barn Auditorium and it is now available to host events. To learn more, check out the following links: https://www.facebook.com/thebroadcastgroup?ref=ts, and http://thebarnatregentpark.com. 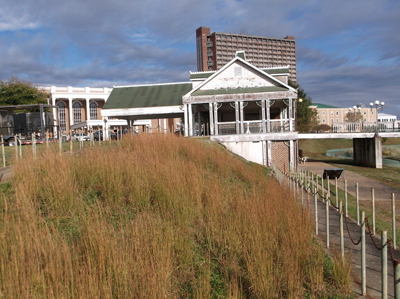 The workers and volunteers have done an exceptional job of restoring this historic landmark. 8. 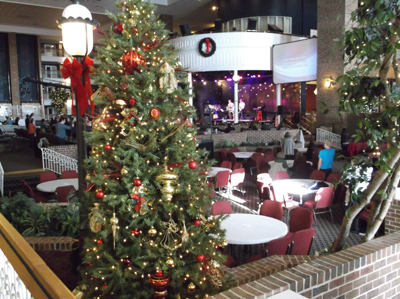 MorningStar Ministries/Heritage International Ministries “HIM” is located in the Heritage Grand Hotel. For more information about this multi-faceted ministry, check out their website at: www.morningstarministries.org. 9. 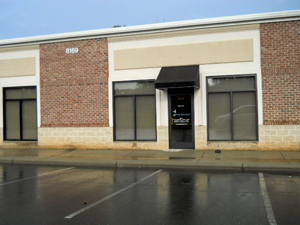 The Jubilee Life Center Church of Charlotte N.C. – pastored by Bishop Charles Gibson is currently leasing the old Wagon Wheel Restaurant and former PTL Campground Registration Office. For more information, check out their website at: www.hgjubilee.org. 10. 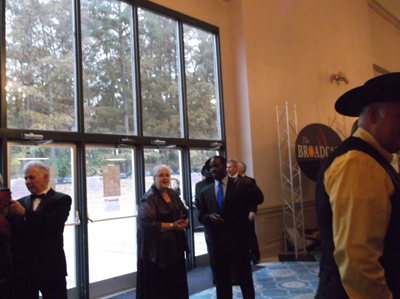 The Grace Church of the Carolinas founded and pastored by Dr. Randall E. Odom moved to Heritage from the Charlotte Banquet Center. Their address is 8160-C Regent Parkway, which is in a building owned by MorningStar Ministries. This multifaceted church was established in 2009 by Dr. Odom, who is also a teacher and writes regular newspaper articles for The Fort Mill Times and the Carolina Gateway. 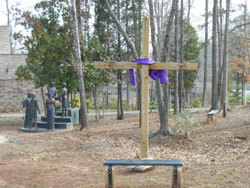 The articles are focused on evangelism, Christian discipleship and raising awareness of Grace Church of the Carolinas. Check out their website at: http://www.gracecoc.org/. 11. 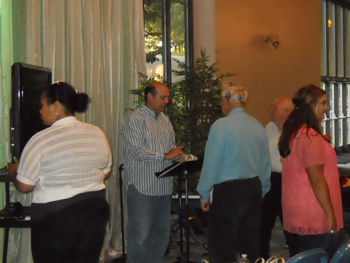 Elohim Christian Center, overseen by Abraham & Adriana Molina, is a church that meets on Friday nights at 7 p.m. in the Dogwood Room at the Heritage Grand Hotel. The Center’s telephone number is (803)-554-7685. 13. 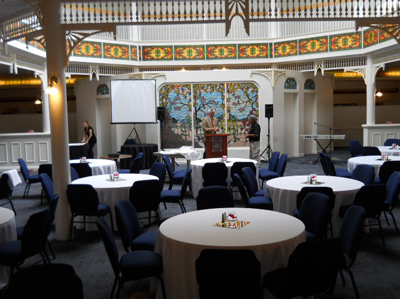 Genuine Praiz Christian Fellowship Ministries was established in 2004 and has recently been holding services at 10 a.m. in the Dogwood I & II rooms in the Heritage Grand Hotel. Pastor Bryan N. Cropper describes the church as “Equipping God’s People for Everyday Living – A Church On Purpose.” There is no website for the church as of now, but they do have a facebook page at: www.facebook.com/genuinepraiz. This actually turned out to be a “Word of Knowledge” from the Lord. Pastor Jim has since showed a segment of that show where he emphatically says, “Pray for Boston!” Many times over Jim Bakker has had a word of knowledge and prophetic insights into the major events of today. Please continue to pray for the people in Boston, Ma. Morningside Ministries, Blue Eye, Mo. On the 1st, Rick Joyner appeared on the Jim Bakker Show to talk about current events, what he sees happening in America, and his recent bold stand on the extraordinary significance of the Boston Marathon terrorist attack. During their discussions, these two long-time friends found common ground in their belief that if America continues to turn its back on God, we will experience more calamities and evil will abound. We are living in dangerous times! Jim Bakker, Rick Joyner and a growing number of other Christian leaders are openly voicing their belief that God will not bless America if we continue eliminating the Bible from our society. Proverbs 14:34 says, Godliness makes a nation great but sin is a disgrace to any people. It is difficult to fathom the Lord withdrawing His blessings from our country, but an eye-opening May 15th article in USA Today appears to line up with what some Christian leaders are saying. In light of the recent terrorist attack at the Boston Marathon, Rick Joyner delivered an explosive Sunday morning message at MorningStar that went viral on the Internet. The message was so bold that it has caused him to make it clear that he is willing to go to prison for his beliefs. 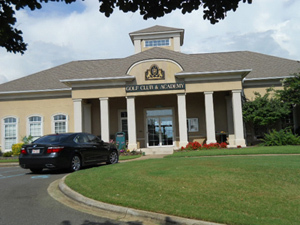 On the 16th, the Towers once again received media attention when attorneys for York County and MorningStar Ministries appeared in the Sixteenth Circuit Court of Common Pleas in York, South Carolina to litigate all the motions that were filed regarding MorningStar’s suit against York County and York County’s countersuit. As of May 31st, the judge has not made a decision on the motions. The tower is ‘remarkably sound from a structural and engineering standpoint,’ MorningStar said in a news release in January. During the month, Tammy Sue Bakker’s No Show Show went back on the air! 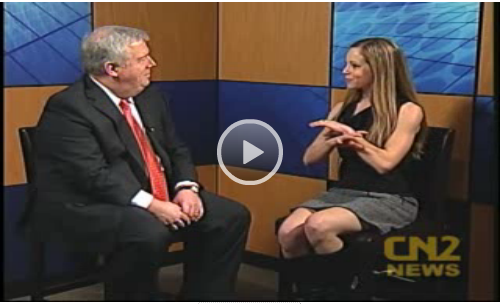 After being off the air for a few weeks, Tammy Sue started doing the No Show Show again. She announced that she and the Morningside Band will return to “live-streaming” programs on the days the Jim Bakker Show isn’t taping. Click on the Jim Bakker Show’s website at www.jimbakkershow.com at 10:30 a.m. (CST) and go to the “watch us” tab to see or listen to this fascinating, uplifting and spiritually centered program. Today, there are hundreds of homes covering the grounds of the former Heritage USA with more on the way. Back in the early 1980’s, when the first homes and condos were being constructed, Jim Bakker fully understood that he was launching into unchartered waters by selling homes on the grounds of a mega ministry. Because of PTL’s enemies, he had the foresight to put in place a stipulation in the building plans that protected the homeowners and homes from the tremendous problem that would have been created if the ministry ever changed hands or shut down completely. 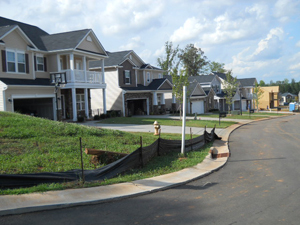 By the PTL Ministry incorporating a provision for the sections of land on which these early homes were built to be independent from the ministry, Jim Bakker insured that the land and homes would not be affected no matter what happened to PTL. He also decided a Homeowner’s Association made up of the homeowners themselves would be an extra safety net of protection. 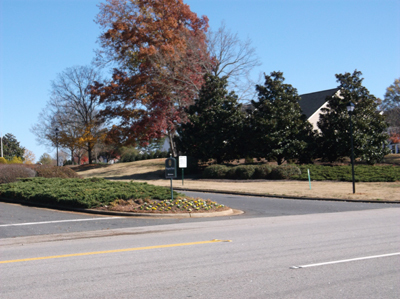 To this day, PTL’s subdivisions remain largely intact and unfettered by all of the huge changes that have been done to the grounds. 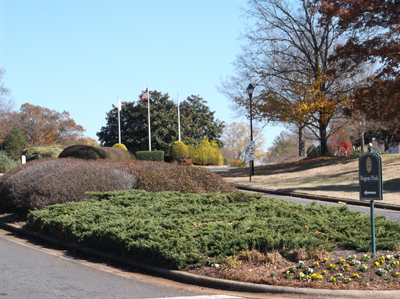 Below are a few current pictures of the PTL Ministry’s subdivisions which were built in the early 1980s. To some, they interfere with the new neighborhoods, but to others they are a nostalgic reminder of the way things were so long ago. Note: When all of the old PTL Shows are re-mastered, there will come a day when people will be able to once again enjoy them on their TV or the Internet. Watching Tammy Faye sing songs of hope and victory, enjoying Uncle Henry’s laughter and sparkling personality, listening to Pastor Jim Bakker preaching the Gospel and the PTL Singers filling the airways again with anointed music is a worthwhile miracle of God to look forward to. People will be terrified at what they see coming upon the earth, for the powers in the heavens will be shaken. Then everyone will see the Son of Man coming on a cloud with power and great glory. So when all these things begin to happen, stand and look up, for your salvation is near! On the 8th, Fox News reported: “The mass exodus of Christians from the Muslim world.” A mass exodus of Christians is currently underway. Millions of Christians are being displaced from one end of the Islamic world to the other. We are reliving the true history of how the Islamic world, much of which prior to the Islamic conquest was almost entirely Christian, came into being. On the 11th, The Washington Post reported: “Libya protests prompt U.S. to evacuate diplomats, put troops on alert.” Growing concerns over protests roiling Libya prompted the State Department to begin evacuating some diplomats from Tripoli, as the Pentagon put troops stationed at nearby European bases on high alert. On the 12th, WND Faith reported: “Anti-Christian war raging at Pentagon.” In light of the confusing statements recently by the U.S. military about whether Christians will be prosecuted for sharing their faith, the chief of a chaplain’s organization says the real question is different. On the 15th, USA Today reported: “USA has the world’s most extreme weather.” North America – and the USA in particular – has the world’s wildest weather extremes: No other part of the planet can boast its ferocious weather stew of hurricanes, tornadoes, droughts, floods, wildfires, blizzards, heat-waves and cold snaps. On the 22nd, Fox News reported: “Experts say Oklahoma tornado’s power dwarfs Hiroshima bomb, as residents face long road to recovery.” Residents of Moore, Oklahoma are returning to sheer devastation after a massive tornado decimated the town Monday afternoon, releasing an amount of energy that dwarfed even the power of the atomic bomb that leveled Hiroshima, according to experts. On the 29th, Fox News reported: “Some 100,000 Christians killed per year over faith, Vatican says.” A staggering 100,000 Christians are killed annually because of their faith, according to the Vatican – and several human rights groups claim such anti-Christian violence is on the rise in countries like Pakistan, Nigeria and Egypt. During the month, Jim Bakker suffered stoke-like symptoms and was hospitalized for three days. After resting for a few weeks, he is doing better and has, thankfully, returned to work. His doctors warned him that he needs to seriously reduce the stress in his life – Pastor Jim has worked in overdrive for years and he needs to learn how to mentally decompress from all the struggles he faces each day and practice getting in a quiet, peaceful place in order to hear from God. The Lord has every problem we encounter under control if we trust, delight and commit it all to Him. Letting go and letting God is easier said than done. Please pray that Pastor Jim makes the necessary changes in his life so he can spend more time with God and fully regain his health. One of the dangers of the End Times is hearing so much and understanding so little. 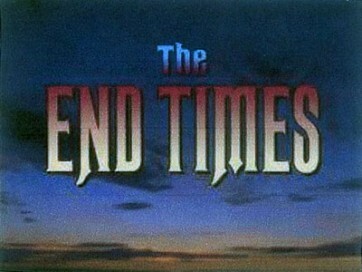 Even the church fails to discern the meaning of End Time events because they have heard it so much and so often, it has lost its impact. 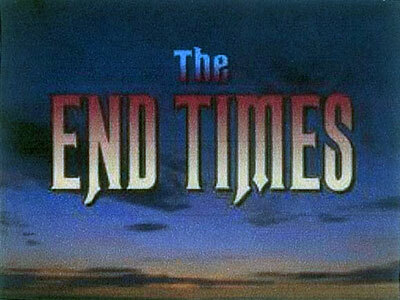 We can’t become desensitized to End Times events! We are bombarded every day with information from every direction. For me, that information can be a distraction, even when it concerns the administration of our world-wide television ministry. Sometimes, a constant flow of information is just a distraction from the greater thing. We cannot allow administration or any other thing to distract us from the main thing. So much information, so many words coming at us from everywhere; our televisions, smart phones, ipads, and even our proximity to others is constantly feeding us information. I know that the plan of the enemy includes distractions and confusion caused by so much ‘noise’ that it makes it hard to hear the important things! Wouldn’t it be a tragedy if, after we have studied, talked about, and generally saturated ourselves with information about the End Times, that we become so busy, busy, busy in our thoughts and activities that we miss the voice of the Lord instructing us in every move we make? In all this information (knowledge), the greatest thing we must be listening for is the voice of our Lord! This is a critical time. Any time after this, we will have done all we could do and our time is over. Then the seals will open and the trumpets will blow and nothing we do or say will affect anything when that begins. I’m struck with a sense of profoundness for this very small window of time. God uses vessels like us to discern and alert and inform. We cannot ere in discerning the Times – and after we discern, we must alert and inform others. These are truly the days we were born for…for this, the grand finale. We have a supreme challenge in the days we live in to not only discern the Times, but to find the time to be still before the Lord in order to hear His voice. Even when life demands our time and attention, we must find the time to spend alone so that God can speak to us. That’s why I often get up in the middle of the night and sit quietly before the Lord. That’s the only time I can be without distractions! 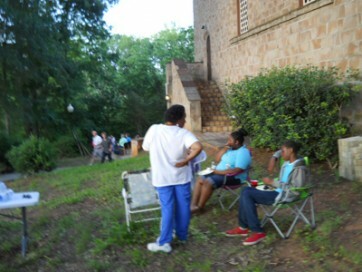 On Saturday evening the 1st, the Upper Room held another outdoor Bonfire/cookout that included roasting hot dogs, toasting marshmallows, good conversations and worship music that was provided by a few members of the church. As always, Russell James cordially invited everyone to come out to the informal get-together that keeps growing in popularity. 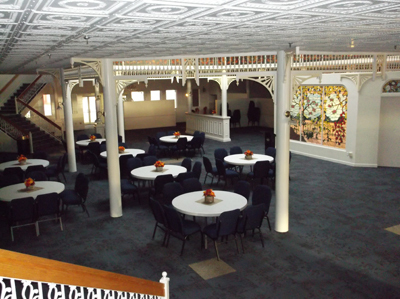 Though the temperature was a humid 86 degrees, the cold soda, friendly fellowship and pleasant music flowing from the cooled upstairs chamber of the Upper Room, created a comfortable atmosphere for both the adults and children. 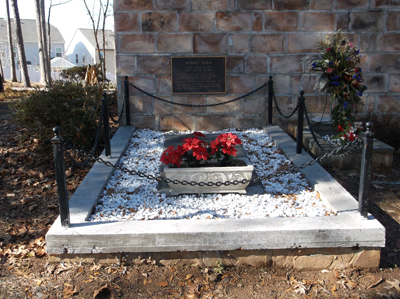 As people chitchatted, Russell told how he and his good friend Fred Yeary transplanted a rose bush from Aunt Susan and Uncle Henry’s former home to the newly created Aunt Susan’s Rose Garden located along the base of the Upper Room’s back wall. At first, the guys didn’t know if it would live because the plant had no leaves and appeared lifeless. But they watered it, fertilized it, and hoped for the best. 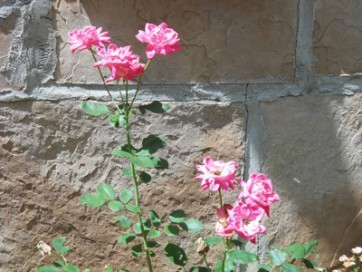 Russell then pointed out the transplanted rose bush that now has beautiful roses blooming on it. Good News! The funds are in for the Upper Room’s parking lot expansion. Preparation work has already begun on the project and it should be completed this year. They definitely need extra parking spaces as more people are attending the church services and special events. 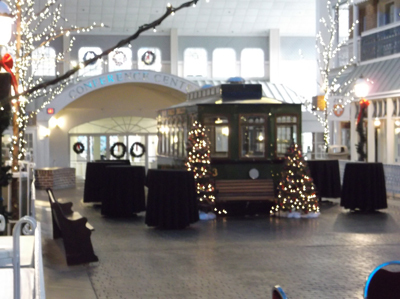 Plus, throughout the year a number of couples choose the historic building to hold their wedding and reception. The Upper Room is open Wednesday night at 7 p.m. for a Bible study on the “End Times.” It is also open for prayer and meditation on Saturday from 9 a.m. to 7 p.m. and Sunday from 1 p.m. to 6:30 p.m. People from the Prayer Team are always there to pray with you or for you at these times. On Sunday mornings at 11 a.m., Bishop Ron Lambright ministers at an interdenominational church service – EVERYONE IS WELCOME. God richly bless Russell James, Bishop Ron Lambright, the Prayer Team and everyone else serving the Lord at the Upper Room. 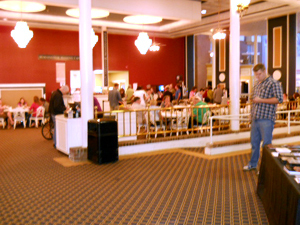 All events related to the Upper Room are usually posted ahead of time on their facebook page at: http://www.facebook.com/groups/62147692320/. The Upper Room Chapel’s website is: www.upperroomchapel.com. My husband Rick was recently healed in the Upper Room. It all started in November of last year when Bishop Ron Lambright prayed for him at the Upper Room prior to an emergency surgery on his left carotid artery, which was 97% blocked. After the delicate operation, Rick’s surgeon said it was a success but he needed to be checked regularly because his right carotid artery was over 60% blocked. 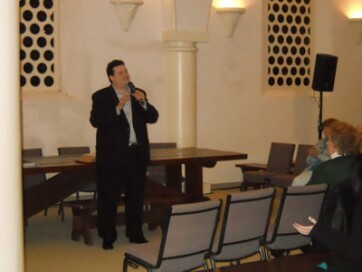 As the Lord predestined, one week in late February of this year Evangelist Kevin Shorey conducted nightly Healing Services in the Upper Room. He was visiting Heritage along with Jim Bakker and the ministry team from Morningside Ministries in Blue Eye, Missouri. On the first night, Kevin called Rick and Bishop Lambright up for prayer at the same time not knowing anything about their health issues. 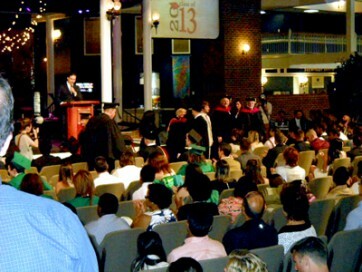 On the 2nd, MorningStar University and MorningStar University College of Theology held their 2013 Graduation. 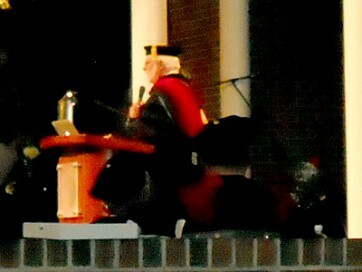 Rick Joyner presided over the ceremonies along with the leaders from both colleges. We pray that God continually watches over all the students that go out on the mission fields in many dangerous places throughout the world. 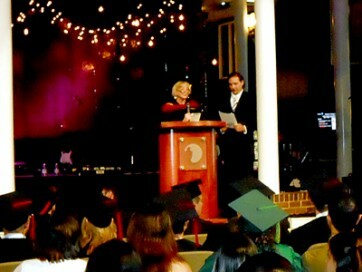 For information about the universities’ diverse programs and the degrees they offer, contact MorningStar Ministries at: www.morningstarministries.org. During the month, tensions mounted between some residents living on the grounds and developer Earl Coulston over the building of yet another apartment complex. Our local newspaper FORT MILL TIMES reported on the apartment complex that will soon be constructed on 11.5 acres of an unused portion of the Heritage Grand Hotel’s parking lot. 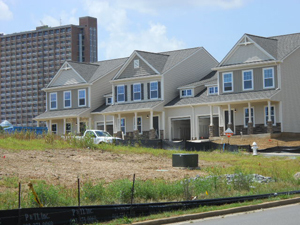 FORT MILL TOWNSHIP – The York County Council cleared the way for the construction of a new apartment complex in the Regent Park area. Council approved third reading of a request by developer Earl Coulston to rezone 11.5 acres around Starlight Drive and Regent Parkway from planned development to business. Meanwhile, an outspoken resident who has been crusading for the demolition of the nearby tower built but never completed by Jim Bakker’s PTL Ministry, criticized Coulston and county council members for allowing the project to proceed. 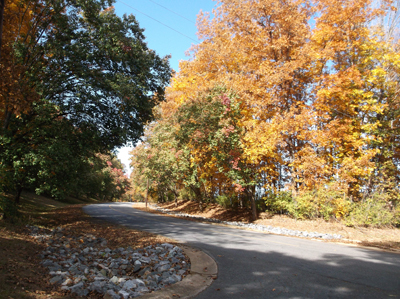 Starlight Drive is a private road owned by MorningStar Ministries, which also now owns the tower built by the PTL, but Kinsinger and other neighbors said they typically use the road as the most direct route to Sugar Creek Elementary School. Kinsinger, who spoke out against the Coulston’s rezoning request before first reading by the county council, said he feels like the developer’s plans are merely rubber-stamped by the county. “(Coulston) seems to do whatever he wants and no one holds him to any standards,” Kinsinger said. 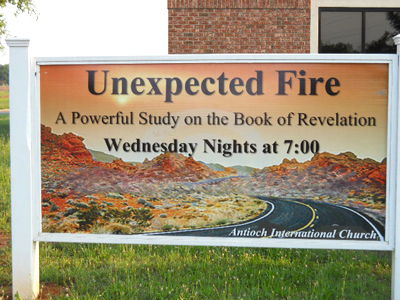 Antioch International Church, pastored by Peter Wyns is currently holding a Wednesday night Bible Study at 7 p.m. on the “End Times.” The Antioch church is located just over the railroad tracks at 8180 Regent Parkway. It is notable that more and more churches are raising awareness of the worldwide biblical events that are pointing to the probability that we are actually living in the times Jesus spoke of in Matthew 24. For more information, Antioch’s website is: www.lifeatantioch.org. 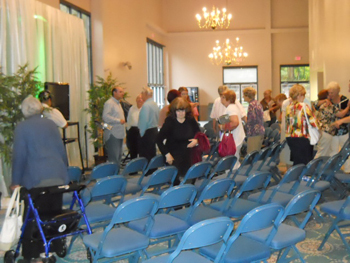 Morningside Ministries in Blue Eye, Missouri: From June 12th – 14th, Jim Bakker’s good friend Rabbi Jonathan Cahn appeared on his TV show. Author of the extraordinary book, THE HARBINGER, Rabbi Cahn mentioned that the book has been on the best seller list of Christian books for 74+ weeks and counting. The documentary of the book THE ISAIAH 9:10 JUDGMENT, which is narrated by Rabbi Cahn, is still the #1 Christian video in the world both in 2012 and 2013. In the documentary Rabbi Cahn gives a startling biblical explanation for the September 11, 2001 terrorist attacks on America, focusing on the destruction of the Twin Towers. Since his last visit to Morningside just a few months ago, Rabbi Cahn now believes America is at a tipping point. He shared some new revelations concerning recent events that relate to the harbingers, which are warnings from God to a nation that once knew God and then turned from His ways. Rabbi Cahn expressed his surprise at how rapidly events are accelerating in almost the same pattern as happened in ancient Israel before it was destroyed. Both Jim Bakker and Rabbi Cahn agreed that step-by-step America is departing from the Bible as man seeks to be God and control everything. Jim Bakker stated there are great divisions between Christian denominations and that God’s people need to break down these denominational walls and come into a place of unity. He pointed out that Heritage USA was a place that welcomed millions of people from all denominations. In an attempt to lead our nation into repentance, Rabbi Cahn is currently organizing a prayer gathering for September 11th, possibly at Ground Zero in New York City. People from every denomination will be invited to gather together for a day of “repentance and prayer.” The time and location of this event has yet to be announced, and there is a possibility that the gathering will extend to more than one location. 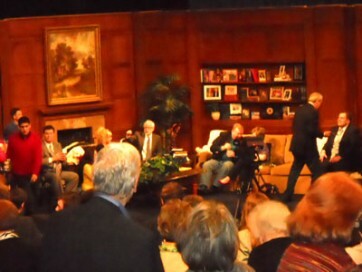 This series of shows with Rabbi Cahn are a “must see,” and can be viewed on TV or in the Video Achieve section of the Jim Bakker Show at: www.jimbakkershow.com. During the month, Jim Bakker continued to regain his health. Since he was hospitalized for stroke-like symptoms, he has had to cut back on his sixteen hour work days to help reduce the stress in his life. In order for Pastor Jim to manage all he does to bring the Gospel to a world-wide television audience, he has delegated some of his many responsibilities to his family members. He has also appointed Evangelist Kevin Shorey as the new pastor of Morningside Church. 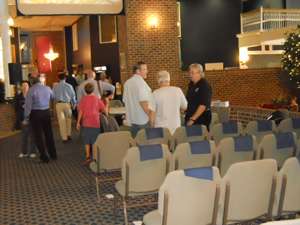 Pastor Jim will speak at the church occasionally, but he has placed it in Kevin Shorey’s capable hands. The Morningside Church meets Sunday mornings at 10:30 a.m. (CST) on Grace Street at Morningside Ministries in Blue Eye, Missouri. These services are also live-streamed on the Internet at: www.jimbakkershow.com. “Stress is a killer,” a well-known fact that I found accurate…the hard way. I had heard the expression many times over my lifetime, but the reality of it hits home when you find yourself landed in the hospital with life-threatening symptoms. The bottom line diagnosis and remedy was echoed by several doctors…de-stress or die! Encarta defines stress as: mental, emotional, or physical strain caused, e.g. by anxiety or overwork. It may cause such symptoms as raised blood pressure. Mental, emotional and physical strain – let’s see…Yes, yes, and yes. Such are the pressures of keeping a world-wide television ministry on the air. To list the individual stressors would be way too…Well, stressful. It’s not easy to do at this age, but I am now committed to de-stressing my life which requires me to change my mind about how I handled certain pressures up until this point. When you make a change of this magnitude, it’s not easy, but it can be done. I made a similar change years ago when I decided to help my body deal with diabetes by eating right. Last minute preparations are being worked out for the annual weeklong July 4th Celebration on the grounds of Morningside Ministries in Blue Eye, Missouri. The Celebration will run from Monday July 1st to Friday the 5th. Special guests will include: Philip Cameron, Mike and Cindy Jacobs, Pastor John Kilpatrick, Kim (Boyce) Koreiba, Bishop Ron Webb and Tammy Sue Bakker. Everyone is Welcome! For the details about the July 4th celebration and accommodations, click on the following link: www.jimbakkershow.com. A look back ~ The below U-tube video of Tammy Faye singing America the Beautiful at a Fourth of July Celebration during the PTL era takes us back for a peek into how wonderful Heritage USA used to be. This particular video is from the day when over 50,000 people from every walk of life gathered together at Heritage USA to celebrate the holiday and the PTL Ministry’s official anniversary. On the 6th, RAI Novosti reported: “Space storm could black out US East Coast for two years – expert.” Severe space “weather” can knock out satellite communications and GPS systems, expose space tourists and astronauts to dangerous levels of radiation, and even cause massive blackouts on Earth that could last up to two years, scientists and NASA officials warned at a conference here on Tuesday. On the 15th, Fox News reported “Some evacuations lifted in destructive Colorado fire that has killed 2.” Firefighters advanced against a monstrous wildfire outside of Colorado Springs, expanding containment lines and lifting evacuation orders for thousands of anxious residents in the most destructive blaze in state history, which has destroyed nearly 500 homes and killed two people. On the 22nd, Fox News reported “Floods kill 3, force 75,000 from homes in Calgary.” At least three people were killed by floodwaters that devastated much of southern Alberta, leading authorities to evacuate the western Canadian city of Calgary’s entire downtown. Inside the city’s hockey arena, the waters reached as high as the 10th row. Harper, a Calgary resident, said he never imagined there would be a flood of this magnitude in this part of Canada. Church Updates: There have been some significant changes since we last updated the church listings in April. It seems as though whenever we update the list, we learn of another new church being planted on the grounds, or of one that has moved away. For example, the Renovatus Church that rented the TV Studio for the past few years to hold Sunday morning church services has moved off the grounds. The Renovatus Church’s website, www.renovatuschurch.org, includes information as to where they are now. We also learned about a new church named, State Line Church of Christ. This gathering meets Sundays at 10:30 a.m. and Thursdays at 7:30 p.m. in the pristine clubhouse at Regent Park Golf Club & Academy located at 5049 Regent Parkway. • Biblical teaching – The Bible is God’s message to mankind, the unfolding of His great plan to save us, and the expression of His will for each of us to follow. Our goal is to follow the New Testament to be a church of – belonging to – Christ, nothing more and nothing less. • Heartfelt worship – As a congregation, we teach each other by singing songs and hymns to God. 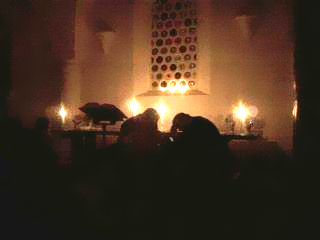 We partake of the Lord’s Supper, the memorial at Christ’s death. We talk to our Father through Christ in prayer. We learn more about God’s will for us through teaching, preaching, and the reading of Scripture. • Caring hearts – Truth without love is as empty as love without truth. We were made to care for each other, to rejoice with each other, and sometimes to cry with each other. We want to be God’s family, brothers and sisters together, helping each other to grow in faith. • Working hands – Faith without works is dead. As God’s children, we should be servants and workers just as Christ was. Additionally, Pastor Randy Hill, who ministers at Praise & Worship gatherings on Sunday nights in the TV Studio, has just announced he is starting a church in mid August. The church will be named Restoration House Worship Center. Pastor Hill is creating a website for the new church that will go on-line as soon as possible. In a July 17th open letter posted on the Upper Room Chapel’s facebook page, Pastor Hill wrote about the new direction the Lord is leading him. God is all about restoration! God spoke to my family to return to Fort Mill, South Carolina, 5 years ago, after 20 years of full time pastoral ministry in Virginia. 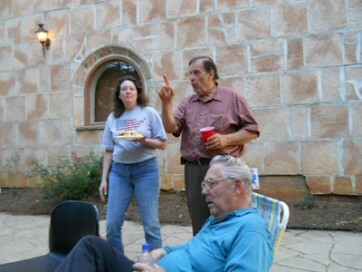 Later He shared with me that He was going to restore ministry again in the former PTL Studio and Barn. 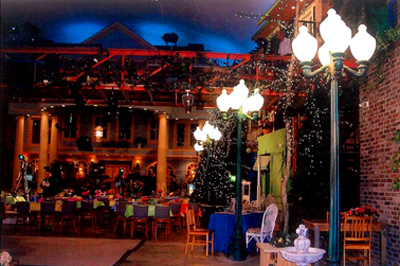 During the last 5 years I have been working with The Broadcast Group to restore the complex. One thing that I said I would never do is pastor another church. I’ve always desired to minister but be a Senior Pastor was something that I decided was not for me. Always be careful when you say “never.” In the month of March in a time of prayer, the Lord began to deal with me about my “never” statement. He spoke to me about his purpose of restoration on the earth and His desire to have a House of Restoration in the Fort Mill area. Currently, Randy Hill Ministries’ website is: www.randyhillministries.org. The Regent Park Golf Course & Academy: The world class golf course was originally part of PTL’s “Master Plan” for Heritage USA. When the ministry was forced to close its doors in 1989 due to the extensive damage caused by Hurricane Hugo, the plans were put aside. One year later, in 1990, Evangelist Morris Cerullo purchased the PTL Satellite Network out of bankruptcy for $7 million while entering into an agreement with Malaysia United Industries to purchase all of Heritage USA. When their plan failed, Morris Cerullo kept the PTL Satellite Network, which had been renamed The Inspiration Network after Jim Bakker’s fall. He then changed the name again to The New Inspirational Network (INSP) and sold his 49% share of Heritage USA to Malaysia United Industries. 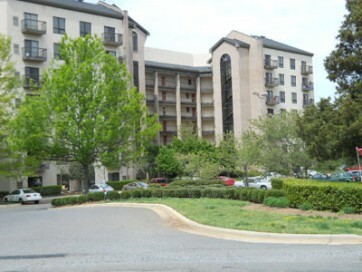 Morris Cerullo quickly relocated the network to Charlotte, N.C., and commissioned his son David Cerullo to oversee it. The Malaysian based company then completed the purchase of Heritage USA and soon after renamed the ministry “New Heritage USA.” It was so confusing that even the media found it challenging to explain these transactions! 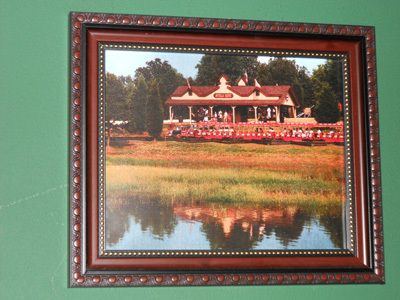 For the next few years the Malaysians worked on repairing and improving the property and reopened “New Heritage USA” in June of 1992. The following excerpt from our book, “LISTEN TO ME!” describes the opening: “While our family slowly unraveled, New Heritage USA opened its doors to the public on Saturday, June 27th. 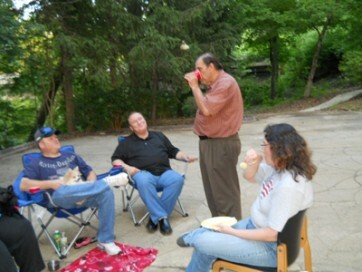 Since we were still living on the grounds, we were invited to the opening day festivities. In a whirlwind of publicity and a guest list that included some well-known Christian personalities, such as Pat Robertson, the Malaysians anticipated the best. They invested a lot of money over the past two years repairing the damages left by Hurricane Hugo. They added an impressive new front entrance as well as developing a portion of the land into a world class golf course, causing them to believe they would flourish and attract millions of visitors once again. All in all, the Malaysians paid a lot of attention to detail and, for the most part, the grounds appeared the same. 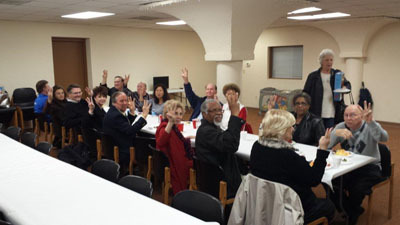 The special parties for the Heritage residents were held in the smaller reception rooms in the Heritage Grand Hotel. The new owners wanted all the residents and homeowners to feel welcomed, and they went out of their way to make everyone feel at ease. As I made my way over to the hotel, I realized that although the Malaysians tried to imitate the same ambiance of the glory days of PTL, there was a tremendous difference in the atmosphere. The Towers: The unfinished Towers continues to deteriorate while there is seemingly no end in sight for its completion any time soon. As expected, MorningStar Ministries’ lawsuit against York County and the county’s countersuit has caused more frustration for some residents and homeowners. The big question remains – Will the Towers be finished or torn down? 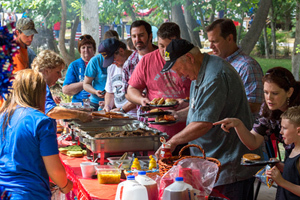 During the month, Jim Bakker wrote about the incredible 4th of July Celebration at Morningside Ministries in Blue Eye, Mo. “This was absolutely the best 4th of July celebration to date! I couldn’t be more excited about the new spiritual infusion we are experiencing and the excitement and anticipation of what God is doing here. We are finally coming into the maturity that we have been longing for! Our partners and friends came from near and far and we had ourselves a time! Paul said that he would ‘become all things to all people’ in order to reach whoever he could (1 Corinthians 9:19-23) – and we are doing the same thing! When I see the passion in the hearts of our Master’s kids to reach their generation, I am delighted to be able to help them! As you sow into this ministry, you are helping them too, with your love and support, and I know that out Father in heaven will someday reward us all with a soul winner’s crown (1 Thess. 2:19). Philip Cameron and the girls from Stella’s House in Moldova were here with us and what a blessing they are! When I see the abundant life these young women have now and then think about what could have happened to them had they not been rescued by God-loving people, it makes me shudder! That’s what the real ministry of the Lord is all about; rescuing the perishing, especially the innocent and the helpless. 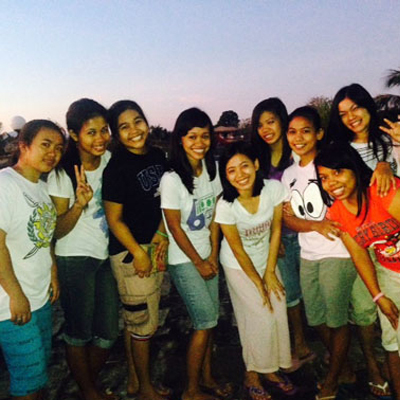 These girls were orphans but no longer…now, they are adopted into the family of God and they are soul-winning machines! Stella’s House and Lori’s House are causes we can be sure are pleasing to the Lord. Both efforts are saving innocent young lives and giving them an opportunity to live and be a great witness for the Lord in these Last Days. We’re delighted that we have progressed with building Lori’s House and have begun the finish work on the inside! It won’t be long now until we can begin saving babies. A call came in as we were taping the 4th of July shows, and there were two girls in crisis needing a place to go! We need to get Lori’s House open ASAP! As you know, it was an uphill battle to get everything lined up and we met with great resistance. But rest assured, with God’s help and your support, we will accomplish our goal! Keep this project in your prayers! Lori sends her love and so do I. 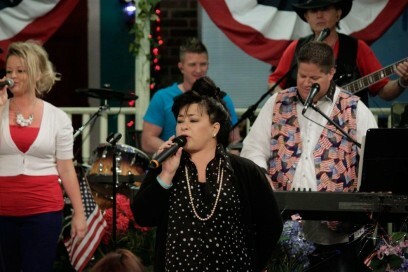 The 4th of July Celebration shows can be seen in the Achieve section of the Jim Bakker Show at: www.jimbakkershow.com. Wednesday at 1:00 PM ET. Please be sure to tune in and join us! On the 1st, Fox News reported: “Hundreds of thousands hit streets in Egypt to protest Morsi.” Hundreds of thousands thronged the streets of Cairo and cities around the country Sunday and marched on the presidential palace, filling a broad avenue for blocks, in an attempt to force out the Islamist president with the most massive protests Egypt has seen in 2 ½ years of turmoil. On the 5th, Fox News reported: “Clashes between Egyptian troops, Morsi supporters turn deadly as thousands protest.” Egyptian troops reportedly opened fire on supporters of ousted President Mohammed Morsi outside Republican Guard headquarters near Cairo Friday as tens of thousands protested in locations all over the country. 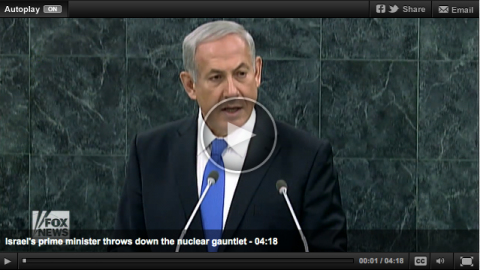 On the 14th, Fox News reported:”Israeli leader urges: Don’t trust new Iran leader, keep up pressure on Iranian nuclear program.” Israel’s prime minister says the world should not trust Iran’s newly elected president. On the 15th, Fox News reported: “Rapid decline of Christian influence in America.” Fox News religion reporter interviewed Evangelical Pastor John S. Dickerson on the decline of the Christian influence in America in today’s society. Click link for story and videos. A Greater Works Church, pastored by Germaine Nichols, moved into Suite 103 in the industrial section just over the railroad tracks at 8169 Regent Parkway. 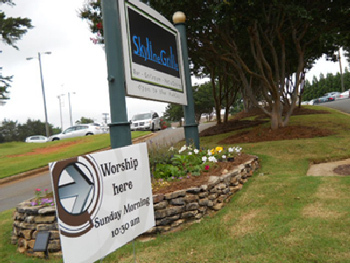 It is a few doors down from the new Legacy Church and across the road from the Antioch Church. 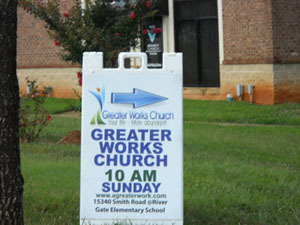 Meetings at ‘A Greater Works Church’ are on Tuesday evenings and Sunday mornings. Learn more about the church at; http://www.agreaterwork.com, or check out their informative facebook page at; https://www.facebook.com/#!/LiveGreater. The Grace Church of the Carolinas founded and pastored by Dr. Randall Odom that met at 8160 Regent Parkway for the past few years has just moved. 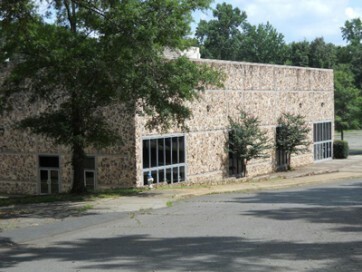 The building they were renting is owned by MorningStar Ministries and it will now be used to house another ministry. It has yet to be announced what ministry will be moving there. The Grace Church’s new address is: 10622 Pineville Road, Pineville, N.C.
For information about MorningStar’s services, conferences, and the many facets of their ministry, check out their website at; www.morningstarministries.com. 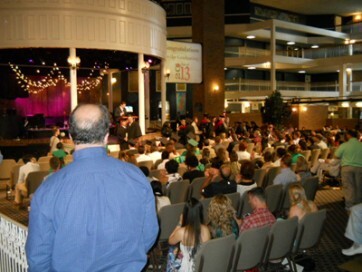 MorningStar’s annual Harvest Fest Conference will be held from September 26th through the 29th. Among the guest speakers is Evangelist Reinhard Bonnke, who brought a powerfully anointed message to MorningStar at last year’s Harvest Fest. The Bible says in Mark 8:36, “The value of one soul is worth more than the entire world,” and Evangelist Bonnke expresses this truth whenever and wherever he preaches the Gospel, winning an astounding 55 million souls to the Lord. This beloved man of God has actually preached to well over a million people at one gathering. It would seem impossible to gather that many people into one area and have peace and order while experiencing the Holy Spirit’s presence, yet this phenomenon occurs whenever he is out on the mission fields. Below is a short video of Reinhard Bonnke’s 2012 visit to MorningStar Ministries that includes a clip of the millions of people he has reached with the Gospel in Africa from 2000–2009. This is a MUST SEE! More New Homes! During the summer, there has been continuous construction of homes on the grounds that dramatically changed the landscape. There is little left of Heritage USA to build on. 1. 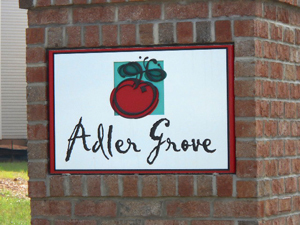 The Adler Grove subdivision, where the former parking lot of the Heritage Island Water Park was located, is now almost completed. 2. 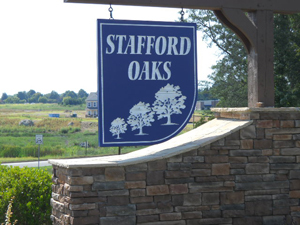 The Stafford Oaks subdivision, where Sugar Creek Campgrounds was located, is on its way to completion. These homes border the Upper Room. 3. 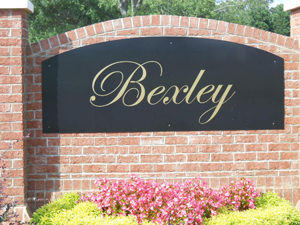 The Bexley subdivision, where Recreation Village once stood, is also nearing completion. 4. 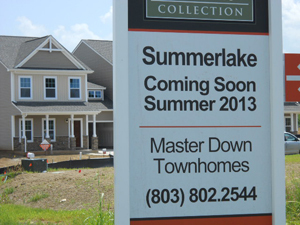 Approximately one hundred Summerlake Townhomes are being constructed across the road from the Heritage Grand Hotel where MorningStar Ministries is located. 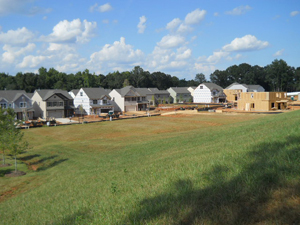 These homes are being built on the property where the Heritage Island Water Park was located. 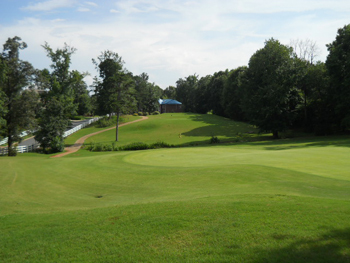 Note: Residents moving into these homes will have access to the Regal Manor Clubhouse where the former PTL Lakeside Lodge’s Timeshare Clubhouse and the timeshare pool were located. 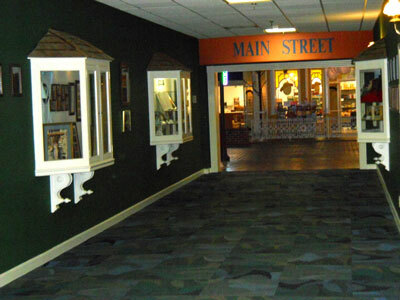 The Heritage USA Museum: This unique museum was started a few years ago by Ben Martin and Clint Rogers and is located in a hallway just off Main Street inside the Heritage Grand Hotel. 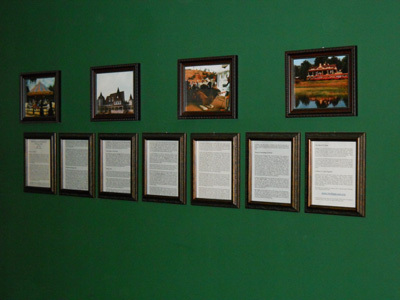 Nostalgic photographs and information about Heritage USA line the walls of the hallway along with display cases that are filled with PTL record albums, souvenirs, books related to Heritage USA and a variety of memorabilia from the PTL ministry. 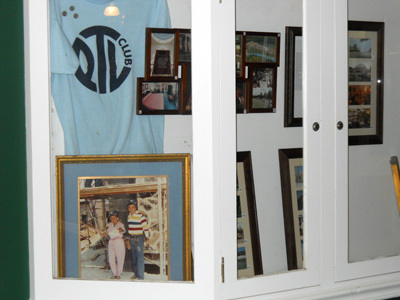 Several donors, including Jim Bakker, have given some of their personal possessions to this modest museum, and both Clint Rogers and Ben Martin hope to one day have a larger facility to house everything they are collecting in order to display the PTL Ministry’s entire history. There are a number of websites and on-line groups where people can discuss today’s happenings on the grounds and share their memories of Heritage USA. One of the popular sites is the Remembering PTL & Heritage USA group on facebook. This interactive group was started by Todd Barwick in 2010 and is a great way to connect with people who fondly remember the former PTL Ministry and Heritage USA. 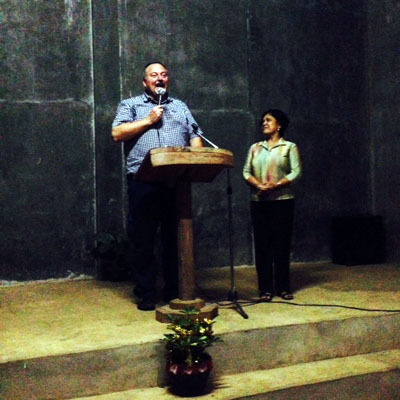 Todd Barwick has recently married and along with his wife is now working on the mission field in Honduras. Before he left, Todd prayerfully entrusted the Remembering PTL & Heritage USA facebook page to Mark Shannon in February of this year. Mark is doing a first-rate job monitoring the wide variety of information that is posted on this facebook page, and his prudent decision to disallow derogatoryor “offensive comments” of individuals or groups is commendable. Click the following link to view or join the Remembering PTL & Heritage USA facebook group: http://www.facebook.com/PTL.Heritage. Note: The original Heritage USA PTL group was started Christmas Day 2002 on Yahoo! groups by Tim Sanford and a few of his friends, and it is now being overseen by Rick Olson, who has been involved since the group’s earliest days. In fact, Tim Sanford, Todd Barwick, Rick Olson and Mark Shannon are the pioneers of these Heritage USA groups that are keeping PTL’s memories alive by giving people a platform to share their stories and comments about the former ministry. These dedicated men were also instrumental in helping to save the Upper Room from destruction by keeping the story and the petition to save the building in the forefront when it looked as if there was no hope for it to be restored. Tammy Sue is maturing into one of the greatest Christian vocalists of our time. With mentors like CeCe Winans, Jeannie Johnson, and her Mom, Tammy Faye, her God-given talent is nothing short of extraordinary. 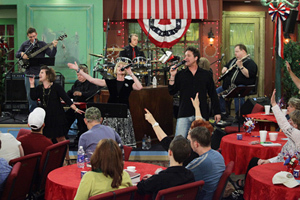 Tammy Sue and the Morningside Band ‘live stream’ the No Show Show from Grace Street at Morningside from Tuesday – Friday at 10:30 a.m.(CST), whenever the Jim Bakker Show isn’t taping. Click on the Jim Bakker Show’s website at; www.jimbakkershow.com and go to the “watch us” tab to see this unrehearsed, non- judgmental, and spiritually centered program that ministers to people from two to ninety-two! To contact the No Show Show, their e-mail address is noshowshow@jimbakkershow.com. Over the summer months, Jim Bakker wrote a series of blogs centered on the thirty-one things the Lord revealed to him back in 1999. Most of these events have already taken place – with more to come. In his latest book, Time Has Come, Pastor Jim explains in the simplest way about the revelation days we are living in. One of the first events the Lord revealed to him back in 1999 was of planes flying into buildings, and explosions in New York City and at a major defense facility in Washington D.C. Though difficult to understand at the time, Pastor Jim wasn’t alone in his belief that a calamity was coming to New York City. The late Pastor David Wilkerson of the Times Square Church in New York City was also shown by God of a calamity coming to New York. Recently, a viewer of the Jim Bakker Show sent in a newsletter that was written by Pastor Wilkerson just a few days after the terrorist attacks of September 11, 2001. Below is a clip from the Jim Bakker Show where Pastor Jim reads a portion of David Wilkerson’s writings. The entire show can be viewed in the Archives section of the Jim Bakker Show at; www.jimbakkershow.com. On the 6th, Fox News reported: “US military evacuates embassy staff from Yemen over terror threat, Americans urged to leave.” The State Department on Tuesday ordered most embassy personnel out of Yemen and urged all U.S. citizens currently in that country to leave over the Al-Qaeda threat that triggered the shutdown of 19 American diplomatic posts this week. On the 14th, Fox News reported: “Egypt’s Interim Vice President ElBaradei resigns while clashes across Egypt leave more than 100 dead.” Mohamed ElBaradei, the No. 2 man in Egypt’s embattled government, abruptly resigned Wednesday in an apparent split with the nation’s leader, as fighting intensified between security forces and supporters of the Muslim Brotherhood. On the 14th, the Blaze reported: “Muslim Brotherhood Supporters Attack Churches Around Egypt in Apparent Retaliation for Military Crackdown as 149 People Killed.” While most headlines from Egypt are focused on Wednesday’s violent dispersal of Muslim Brotherhood supporter sit-ins – latest death toll placed at 149, per the Associated Press – Christians in the embattled country are facing what’s being described as “a black day” as their churches are being attacked and torched by angry Islamists. On the 15th, Fox News reported: “California economist says real US debt $70 trillion.” The federal government has been low-balling the public for years on how much debt it actually has, a University of California, San Diego economics professor says, adding that the real amount is $70 trillion – not $16.9 trillion. On the 21st, Fox News reported: “’Poisonous gas’ attack by regime troops kills at least 100 in Syria, activists say.” Syrian opposition groups say a “poisonous gas” attack during a government offensive near Damascus has left at least 100 people dead, with images showing pale, lifeless bodies of children lined up in makeshift hospitals. On the 21st, Fox News reported:”Faith-based charity to airlift persecuted Christians out of Sudan.” An international relief agency plans to airlift some 3,400 Christians out of Sudan, where they face increasing persecution from the Islamist government. On the 23rd, Fox News reported: “Israeli warplanes strike Lebanon in response to rocket attack.” Beirut- Israeli warplanes struck a target south of Beirut early Friday, a day after militants fired four rockets into northern Israel, the Israeli military and a Palestinian official said. During the month, Rick and I took pictures of a few landmarks that most people who visited Heritage USA would not recognize today. As we looked around, we noticed the marks from the rails the PTL tourist trains rode on are still noticeable on the old wooden bridge that crosses over a narrow mote in front of the hotel. The bridge connected the trains traveling from the Heritage Island Water Park to PTL’s mainland. It was used exclusively by the colorful passenger trains as they slowly wound their way to the train depot at the lower level of the Tram Stop. During the peak of PTL’s success, countless visitors both young and old very much enjoyed taking a scenic train ride that was accompanied by a friendly tour guide. Click on arrows below to see slideshow. 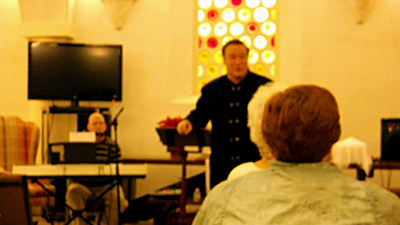 Over the years, critics of the PTL Ministry said that Heritage USA came apart because it had a “circus-like” atmosphere, having little value in the Body of Christ. The Bible says in 1 Corinthians 1:27, But God hath chosen the foolish things of the world to confound the wise, and purchasing trains for Heritage USA was, at the time, considered by some as a very “foolish thing” for a Christian retreat to do. However, those seemingly “foolish” trains transported visitors to places where they heard uplifting Gospel music coming from the open air theater at Buffalo Park and experienced the peace-filled presence of God while taking in the size and scope of the immaculate grounds. A train or tram ride brought some of the ‘least likely’ to attend a church into an atmosphere where they became open to hearing the Gospel. 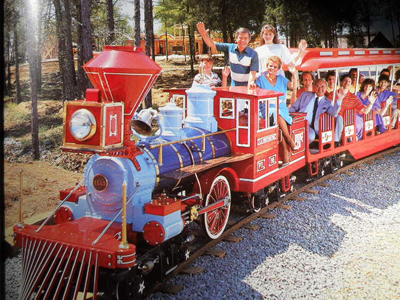 To this day, many of the people who were saved through the PTL Ministry remain thankful to the Lord for a place that forever changed their lives through the “foolishness” of going on a relaxing train ride where they were introduced to the saving knowledge of Jesus Christ. Thank God for the dedication of those who operated the trains and those who gave guided tours to the passengers. Truly each worker in the PTL Ministry greatly contributed in helping unsaved people’s hearts soften towards receiving the Lord. 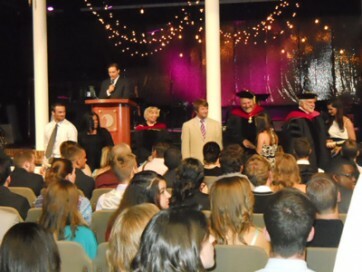 On the 10th, classes began for the 2013-14 school year at MorningStar University & MorningStar University College of Theology. 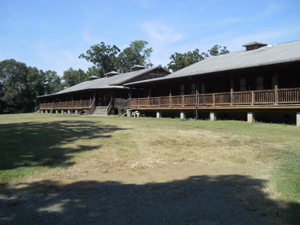 Many of the new students settled into the rustic old PTL Bunkhouses across the roadway from the hotel. MorningStar Ministries moved the two large bunkhouses from their original location near Farmland where they had sat abandoned for years. They have since been restored and put to good use as dormatories. 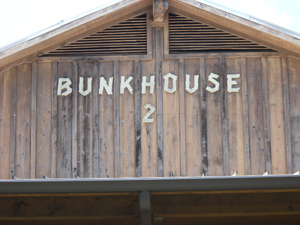 Click below to see slideshow of the bunkhouses today. May God abundantly bless and enlighten each student during the school year as they study the Word of God and learn how to serve the Lord in whatever service He calls them to. A MorningStar University class on Main Street pictured below. On the 11th, Jim Bakker once again invited Pastor John Shorey on his show to discuss today’s major news events that are happening worldwide depicting the times Jesus spoke of concerning His return. John Shorey also believes the rebirth of Israel in 1948 is critical to the end time scenario. He explained to viewers that two-thousand years ago, in 70 A.D., Israel was destroyed by the Roman army causing the Israelites to wander the earth without a country from then on. The Jewish people’s astounding return to their land and becoming a nation once again is an “against all odds” miracle, and is the starting point of the generation that could see Jesus’ return. “Israel had to become a nation for the pieces of the window of the Lord’s return to begin,” John Shorey emphatically stated. Jim Bakker and John Shorey went into an in-depth conversation over Jesus’ words in Matthew 24 that explains the signs of the times preceding His return. According to the Bible, there will be a “certain generation” that sees it all! Because Jesus told his deciples in Matthew 24:34, I tell you the truth, this generation will not pass from the scene until all these things take place, both ministers are driven to bring this message to as many people as possible. During these shows, John Shorey brought out the fact that Iran and Syria have spent billions of dollars to obtain cruise missiles, high-tech sophisticated weapons and weapons of mass destruction, leaving Israel surrounded by highly armed enemy nations bent on destroying her. Note: Because of the unprecedented times we are living in, Jim Bakker made an executive decision to change the format of his programs to include more of today’s prophetic voices. He made the point that, “We don’t agree on every ‘jot and tittle’ in the Bible, but we can come together and reason together.” He commented that people by the millions won’t be ready to meet the Lord when he returns, and said that God told him to continue to warn people regardless of the harassment he continually receives from his critics. These dramatic programs aired during September and can be watched in the Video on Demand section of the Jim Bakker Show at: www.jimbakkershow.com. On Sunday the 15th, at MorningStar Ministries’ church services, Rick Joyner gave one of the most powerful messages he has ever preached there. It was truly a wake-up call for the church and a way forward, through repentance, to experiencing a revival in America which is so desperately needed. Over the past few years, more pastors are in agreement with America’s need to return to biblical principles because we are not the same nation we once were thirty years ago. Though Christian leaders differ on church doctrines, it is encouraging to realize that they are finding common ground in America’s need for God’s rules of order to be restored. America’s return to the Lord will not stop the end time clock, but our country could be spared from God’s harshest judgments. 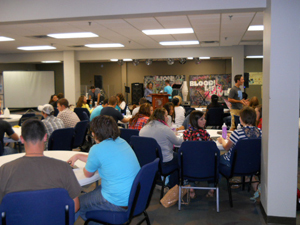 From the 26th – 29th, MorningStar Ministries hosted its annual Harvest Fest. Lights, cameras, music and ministry connected hundreds of people from around the world to gather together and enjoy this spirit-filled event. It was amazing to experience the energy, fellowship, and the powerfully moving messages given by MorningStar’s special guest speakers. Guest speakers included Rev. Reinhard Bonnke, Rick Joyner, Todd Bentley and Mike Warnke. To purchase the entire Harvest Fest Conference on DVD or CD contact MorningStar Ministries at: www.morningstarministries.org. 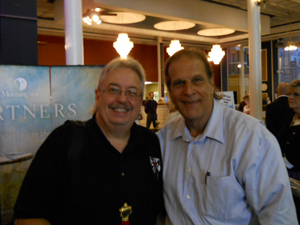 Long time friends Mike Warnke and Russell James meet up during the conference. 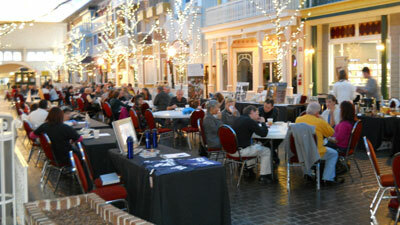 The Upper Room: On the 28th, Russell James hosted a ‘Susie Moppet Day’ at the Upper Room. 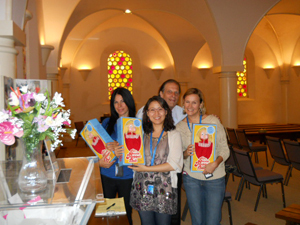 From 9:00 a.m. to 5:00 p.m., original Susie Moppet dolls were given away to the first 100 ladies who came into the Upper Room. These popular PTL dolls were the last ones delivered to Heritage USA in 1985. 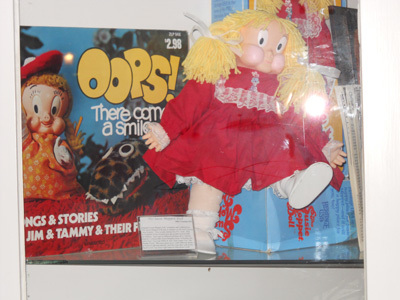 Each doll is a collector’s item and contains a number of encouraging messages recorded by Tammy Faye. God Bless Russell James’ generosity! Video of Tammy Faye on the PTL Show singing her uplifting song YOU CAN MAKE IT! So many unprecedented events are happening around the world that it is difficult to keep up with them all. Now, a few media outlets are actually making reference to the Bible in their reporting. Below are some of the most dramatic reports relating to the Bible. 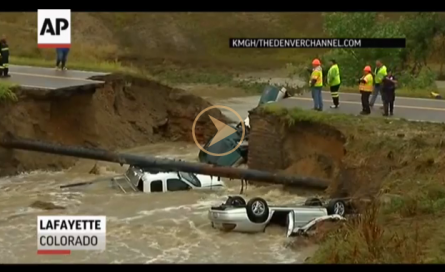 On the 12th, USA Today reported: “Biblical” rains trigger flooding that kills 3 in Colo. Massive flash flooding along Colorado’s picturesque Front Range Mountains, triggered by what the National Weather Service termed “biblical rainfall amounts,” killed at least three people Thursday, cut off small towns and left countless residents scrambling for high ground. Click photo for full story and video. On the 22nd, CNN reported: “Suicide bombers kill 81 at church in Peshawar, Pakistan.” Choir members and children attending Sunday school were among 81 people killed in a suicide bombing at a Protestant church in northwest Pakistan. It was one of the deadliest attacks ever on the Christian community in Pakistan. On the 24th, Fox News reported: “UN official demands access for aid in Syrian areas where chemical inspectors go.” Aid workers must be given access if parts of Syria come under a cease-fire to allow chemical weapons experts to try to bring the country’s stockpile under international control, the head of the UN’s World Food Program said. As Syrians prepare to face their third winter in conflict, thousands including women, children and seniors, need food, medicine, blankets and other humanitarian aid. On the 24th, Fox News reported: “Kenya, Pakistan, Egypt – – it is now open season on Christians.” Attacks on Christians and other minorities in the Muslim-majority world are increasing and an already terrible situation is worsening. 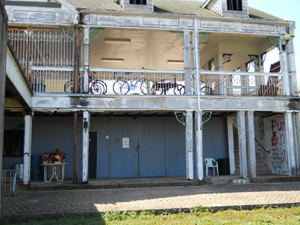 MorningStar Ministries – During the month, Rick Joyner and MorningStar’s Vice President Dave Yarnes announced the ministry is coming into its “final phase” of restoration on the Heritage campus. This final phase will include transforming the main Tram Stop in front of the Heritage Grand, and restoring the kitchen at the end of Main Street in the former PTL Grand Palace Cafeteria. Below is a portion of an e-mail that was sent out to all MorningStar partners describing these projects titled Vital Projects Update. “During the peak years of PTL, the Tram Stop served as the connecting point for the entire ministry. We are now undertaking the transformation of this unique structure into the place of interchange and connection to God as a place of continuous intercession and worship to the Lord. 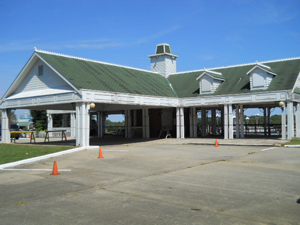 With its scenic view of Heritage Lake, and a large portico and deck stretching out over the water, the Tram Stop will also become a place for fellowship, small ministry gatherings, prayer times, and celebrations such as weddings. We know prophetically that it will be a place of great joy being released. 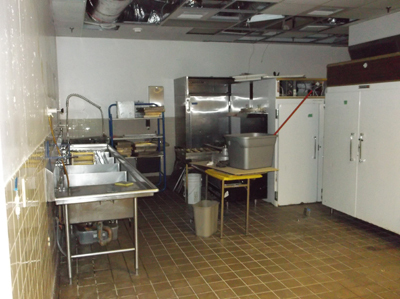 Equally important, the Conference Center Kitchen within our Heritage facilities was at one point the world record holder as the restaurant serving the most people within a 24-hour period. 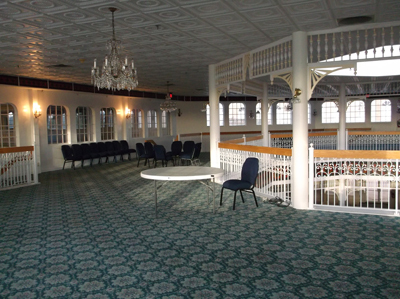 This is the last remaining un-restored area of the 500,000 square foot Heritage Grand Hotel and Conference Center. It is a basic goal that we have as a ministry to do the most we can with what we are entrusted with. We were given estimates of nearly a half-million dollars to bring this back on line, but now have a plan to do it for about $85,000. 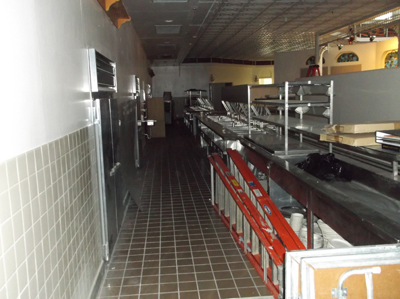 We are expecting to finish both of these projects for $300,000. To read the entire message, click link: Restore H.I.M. Russell James will host a Celebration Service for the third anniversary purchase and restoration of the historic Upper Room on Saturday, December 14th at 1:00 p.m. Everyone is invited to this special celebration where Russell will give an update on the improvements made to the building since last year, share his vision for the coming year, and he may have a few surprise announcements. This will be a great time of fellowship and thanking God for all the answered prayers and miracles that continue to take place in the Upper Room. 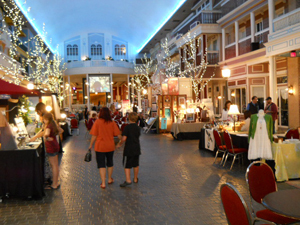 Through all of the uncertainty surrounding the Upper Room’s fate, Russell James purchased the building in November 2010; just a few weeks before it was to be torn down if it was not sold. The timely purchase and restoration of the Upper Room is one of the most profound miracles in Heritage USA’s history. Note: Refreshments will be served after the service. ALL ARE WELCOME! 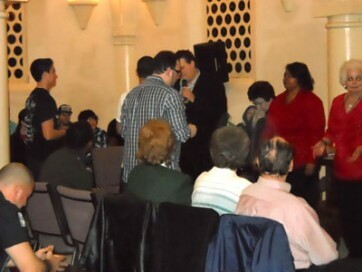 For information about the happenings at the Upper Room and when it is open, click on their facebook page at: http://www.facebook.com/groups/62147692320/ or go to the website at: www.upperroomchapel.com. During the month, Rick Joyner caused quite a stir in the national media through one of his weekly ‘Prophetic Perspective on Current Events’ Internet broadcasts where he foresees the possible destruction of America’s republic. Jennifer LeClaire, news editor at Charisma Magazine, wrote one of the articles concerning Rick Joyner’s alarming broadcast. “In his weekly Prophetic Perspective on Current Events broadcast, Rick Joyner predicted the destruction of America’s republic—maybe even during President Obama’s second term. Joyner prefaced the Internet broadcast entitled “Has Democracy Failed?” by warning viewers that he would say some things that may be shocking. 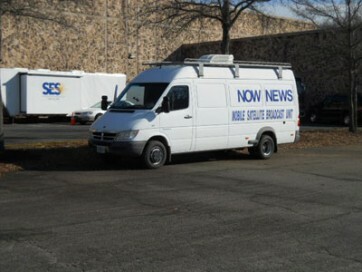 The segment was filmed on the day before the government shutdown. From Joyner’s prophetic perspective, the republic of the United States of America is crumbling because of tyranny from the government and from the people. As Joyner sees it, no election is going to fix America’s problems because the system is broken. He believes our only hope is a military takeover—martial law. “My warning about martial law coming to America has created many questions that deserve answers. I will address some of these here, as well as further clarifying what I am predicting, and what I am not predicting that some have assumed that I am. I will then address what is causing this crisis, and what we need to do to be prepared for it. oI am not advocating martial law. o However, it is inevitable. If we are prepared, we can get through it and come out of it better, stronger, and continue as a Republic. If we are not prepared, it can lead to a terrible tyranny. o I am not predicting martial law based on any conspiracy theory. o All of the revelations that have come out recently about the NSA, the IRS, etc. should be deeply troubling to every American, but they are not the basis of what I am predicting. Neither is the purchase of hundreds of millions of rounds of ammo by government agencies or their purchase of armored vehicles, though this too should be alarming to any thinking person, yet these are not the basis of what I’m saying. Neither is any other conspiracy theory. o I am not sounding this warning because I think martial law is something Obama is scheming to do. o I am troubled by the “control freak” nature of the Obama Administration as it was recently characterized in the New York Times. I disagree with the direction in which President Obama has led our country, but this is not why I see martial law coming. o I do not think that martial law is something our military leaders are scheming to do or want to see happen. o Martial law is the last thing most military leaders would want to see happen. Of course, the few who may not be appalled by this prospect would be the ones we should pray do not become the martial. o The Republican and Democratic Parties are equally culpable for what has led us to where martial law will be needed to help save the Republic. o The Founding Fathers were not infallible or necessarily right about everything, but they did have uncommon wisdom that I have become convinced was divinely inspired. They were right that our Republic could not last if certain basic firewalls were removed. They placed these firewalls in the Constitution to preserve it. Republicans and Democratic Administrations have both been responsible for tearing down these firewalls, and now the consequences are as predicted. o Tyranny can come from the left or the right. o We should be equally concerned about extremes from either side. As devastating as the sharp turn to the left may have been in recent years, and as much as we may need to turn back to the right for a time, an ultimate danger can come from overreacting and going too far to the right. More will be said about this later. o To navigate safely through the storms we are entering will take the wisest and most decisive leadership we have ever had. When martial law comes, who the martial is will be critical. We need to pray for someone who is like George Washington—deeply committed to the Republic yet who does not want the job any longer than is necessary to get us back on a solid foundation. We need one who is not an ideologue from either extreme. o Martial law does not have to be the end of our story. It can be just a temporary emergency that we must go through to get back on track. 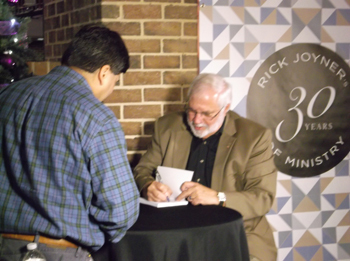 NOTE: Rick Joyner will be a guest on the Jim Bakker Show November 19th at Morningside Ministries in Blue Eye, Missouri – For more information click link: www.jimbakkershow.com. In Acts Chapter 2 verse 20, the Bible confirms that there will be signs appearing in the sun and in the moon: The sun will become dark, the moon red as blood, before the overwhelming and glorious day of the Lord will come. What is so startling about blood moons is there have only been three times in the last five-hundred years that four blood moons have appeared in a two-year period that are in conjunction with the Jewish holy days of Passover and the Feast of Tabernacles. The first recorded four blood moons appeared on the Jewish holy days of Passover and the Feast of Tabernacles in 1493-1494, during the Spanish Inquisition. This was a time when the Jewish people were being persecuted; some were tortured if they didn’t convert to the religion of that time, some were forced to flee without a single thing they owned, and some were reported to have actually left on Christopher Columbus’ ships when he discovered America. The second set of four blood moons appeared on the Jewish holy days of Passover and the Feast of Tabernacles in 1949-1950. This was around the time when the Jewish people returned to their land and Israel was miraculously reborn as a nation. 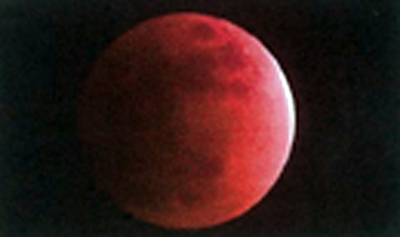 The third set of blood moons were recorded by NASA as occurring in 1967-1968 when the Six Day War against Israel took place. Israel not only won the war in six days, but against all odds recaptured Jerusalem for the first time in 2000 years. Once again these blood moons appeared on the Jewish holy days of Passover and the Feast of Tabernacles. Total Solar Eclipse on March 20th, 2015. Jim Bakker became so passionate about this information that he included a copy of Pastor John Hagee’s new book Four Blood Moons with the love gifts he offered during Billye Brim’s visit. To see this amazing teaching, click on the below video of Jim Bakker’s Show where Billye Brim explains the Blood Moons to Jim & Lori and the viewing audience. 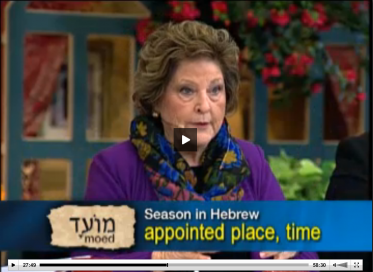 Billye Brim’s teaching gets very explicit about twenty-five minutes into the broadcast. 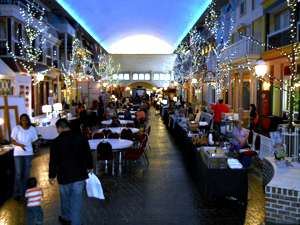 On the 31st, MorningStar Ministries held their annual Fall Festival in the front of the Heritage Grand from 5:30 p.m. – 8:30 p.m. 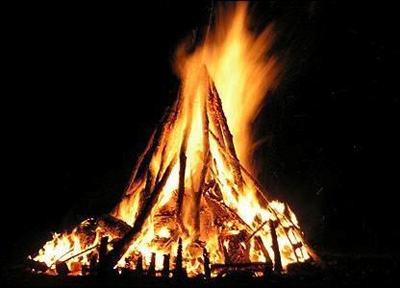 This yearly event welcomes every person and family living in the area to an enjoyable night of fun. 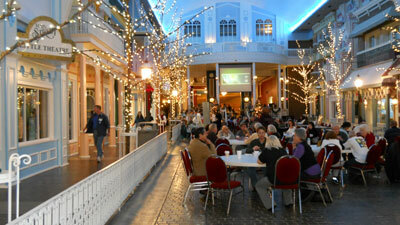 MorningStar provided the games, rides, live music and fabulous food! 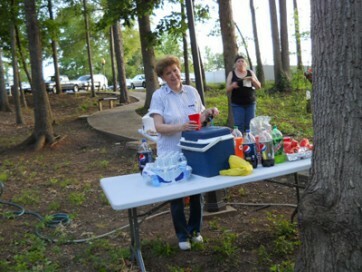 It is one of the friendliest times at MorningStar as many people from the neighborhood come together. 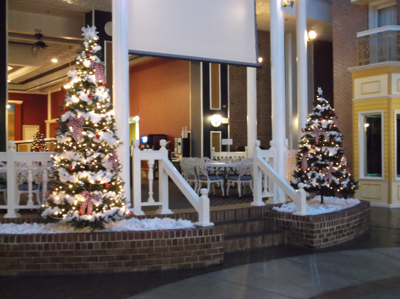 People sometimes ask if Heritage USA really had Christmas displays that stretched over the entire grounds. 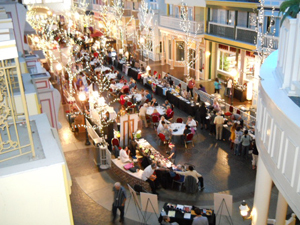 During the 1980’s, PTL not only had one of the largest displays of Christmas lights in the Carolinas but Heritage USA’s Christmas City was one of the more popular destinations for travelers from around the country all during the holiday season. Each night between November and January cars would line up, often for over two miles, waiting to drive through the grounds to enjoy the spectacular two million sparkling lights that transformed Heritage USA into an amazing winter wonderland for all people. There will be famines and earthquakes in many parts of the world. But all this is only the first of the birth pains, with more to come. On the 10th, the Blaze reported: “A record-setting blizzard killed 75,000 cows and you might not have ever heard about it.” Ranchers are still digging out thousands of their cattle that became buried in a record-setting snowstorm in South Dakota late last week and over the weekend. On the 15th, Fox News reported: “At least 93 people dead after 7.2 earthquake hits central Philippines.” The death toll from a 7.2 magnitude earthquake that struck the central Philippine island of Bohol on Tuesday rose to 93, as rescuers struggled to reach patients in a collapsed hospital. Centuries-old stone churches crumbled and wide areas were without power. On the 19th, RT USA reported: “US debt surges $328 billion in single day, surpassing $17 trillion for the first time.” Just one day after President Barack Obama signed into law a bipartisan deal to end the government shutdown and avoid default, the US debt surged a record $328 billion, the first day the government was able to borrow money. its systematic persecution of non-Muslims. On the 25th, Fox News reported: “No report of damage after 7.3 magnitude earthquake hits Japan.” An earthquake of magnitude 7.3 struck early Saturday off Japan’s east coast, the U.S. Geological Survey said, and Japan’s emergency agencies issued a tsunami advisory for the region that includes the crippled Fukushima nuclear site. 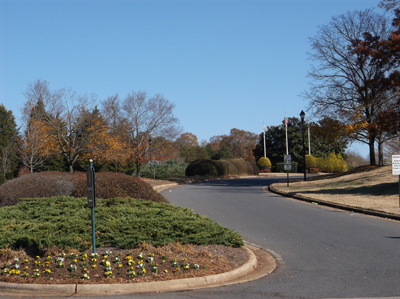 Today, Heritage Boulevard is a road less traveled, but it was originally the official entrance to Heritage USA that everyone used. 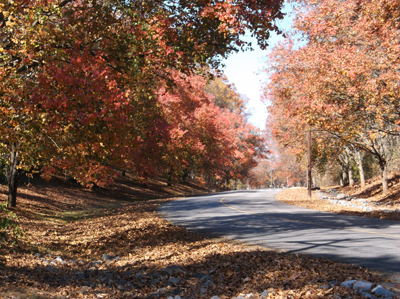 By design, this picturesque winding road with its 25 mph speed limit still offers a relaxing way to get into the main area of Heritage. Most visitors from back in the day fondly remember the mile-long driveway as an inspirational ride that brought them into a Godly atmosphere of expectation and peace. 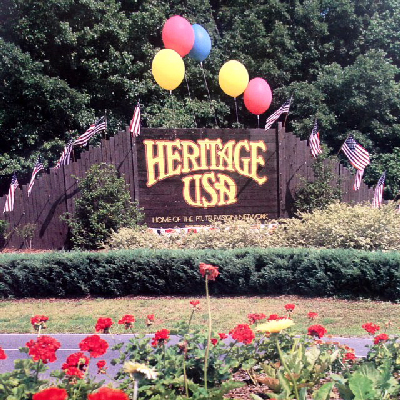 Despite the countless changes to the grounds over the past three decades, Heritage Boulevard has remained unaltered since Heritage USA first opened in the late 1970’s. It is one of the few main roads that hasn’t been reconfigured, steamlined or added since PTL changed hands in 1987. 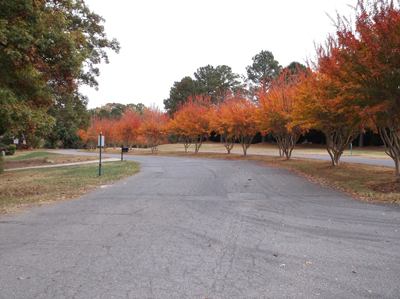 In the fall, the immaculately kept entrance and roadway are enhanced with a palette of bold, multicolored leaves on a variety of trees and bushes lining the entire drive. What is missing are the long forgotten HERITAGE USA signs that were out front on Old Nation Road (formally Business 21). Note: A little known fact as to why the roads on the grounds are always immaculate is that for years now a “father & son” team regularly drives around Heritage in a specially designed cart picking up every piece of trash tossed on the roads. These unsung heroes are a tremendous blessing to everyone living here. 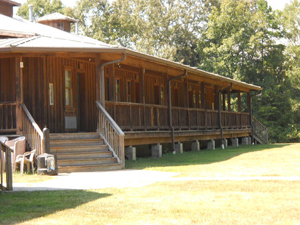 On the 9th, PTL’s former TV Studio at The Barn became the new venue for the third annual Artists Music Guild Heritage Awards weekend event. 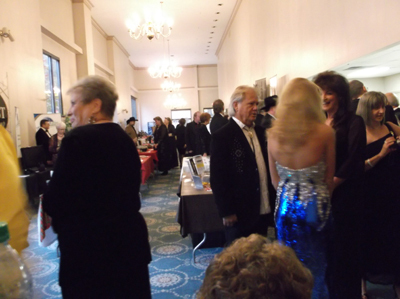 The Artists Music Guild (AMG) was created by David L. Cook, seven-time Emmy Award winner and a member of the Country Gospel Music Hall of Fame. 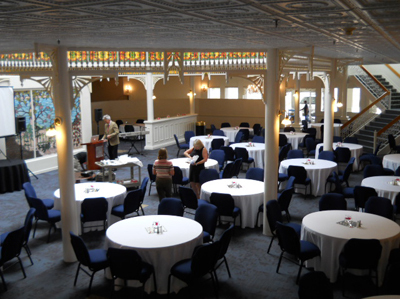 For the past two years this event had been held in the Heritage Grand Hotel, but the Guild recently partnered with The Broadcast Group for a potential expansion of music events in the fully restored Barn and TV Studio. The entire Saturday evening Awards Ceremony will be broadcast on TV. Check the Artists Guild’s website at: http://artistsmusicguild.com/content/ for the date and time, or contact The Broadcast Group at: http://thebroadcastgroup.com/. The weekend itself was filled with entertainment, awards, music legends and mentoring young artists. Especially moving at the Awards Ceremony was a special tribute to Gospel singer Sandy Hosey, who passed away from cancer earlier this year. The Artists Guild has officially named their Lifetime Achievement Award after her. The first Sandy Hosey Lifetime Achievement Award went to Dr. Dale Hill, founder of the The Broadcast Group and new owner of The Barn Auditorium. Dale Hill started in TV production as a teenager working behind the scenes with Jim Bakker back in the 1960s on the 700 Club. Eventually, he worked his way up to Senior Vice President in charge of TV production for the entire PTL Ministry. This is the man responsible for daily bringing the PTL Satellite Network into countless homes worldwide, helping millions of people come to the saving knowledge of the Lord. Dr. Dale Hill later started The Broadcast Group, a media company that has done TV production work for mega ministries as well as major sporting events, including the NFL, ESPN, the Trinity Broadcasting Network and T.D. Jakes. He has also helped Jim Bakker and his production staff at Morningside Ministries in Branson, Missouri to produce special events. Most recently, Dale Hill helped produce the TV programs of Jim Bakker’s historic return to Heritage USA in February of this year. 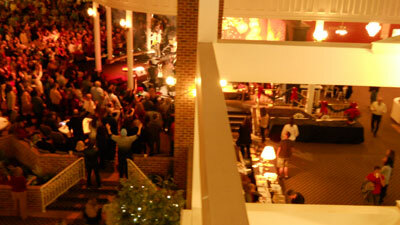 The following Slideshow was taken before the Saturday night Awards Ceremony started. In it, is a unique picture of the 1960’s Rock & Roll star Chubby Checker with world renowned pianist Dino Kartsonakis on the red carpet. A red-carpet event Saturday will bring one of the most famous names in music to Fort Mill. Chubby Checker, best known for his 1960 recording of “The Twist” that topped music charts that year and again two years later, will host the 2013 AMG Heritage Awards on Saturday at The Barn at Regent Park. A man, his smile beaming from cheek to cheek, entered the stage at The Barn on Regent Parkway late Saturday night. His gate was slow, but purposeful, calm, but confident. 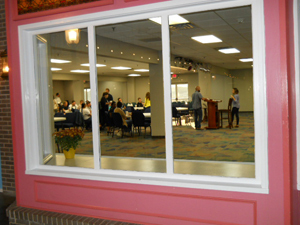 The Upper Room: On Sunday the 17th, the Upper Room held a Thanksgiving Dinner after their 11a.m. 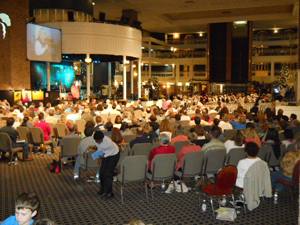 church service in the downstairs level of the building. 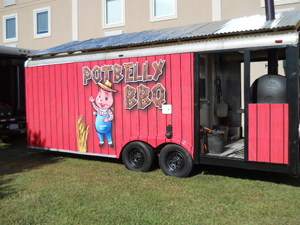 Pastor Lambright invited whosover wanted to come and just asked that they bring their favorite Thanksgiving dish. The Upper Room doesn’t disappoint when it comes to the holidays – Russell James and Pastor Ron Lambright both understand how lonely and painful the holidays can be for many people. These two godly men have given up many of their holidays to spend at the Upper Room to ensure the doors are open. It is an amazing blessing to see that the Upper Room has not deviated from its original purpose of ministering to people even on the holidays. For information about the happenings at the Upper Room and when it is open, click on their facebook page at: http://www.facebook.com/groups/62147692320/ or go to their website at: www.upperroomchapel.com. 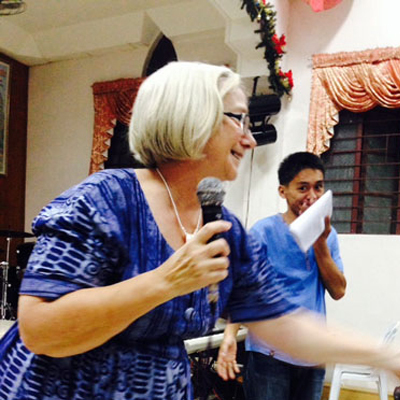 During the month, our special friend Nancy Daniel, Creative Team Captain for the Missions Department at MorningStar Ministries, left on a mission trip to the Philippines. She went with Jorge Parrott, Director of MorningStar Missions, and his wife Anna to visit some of the many churches planted by CMM (Christ’s Mandate for Missions). 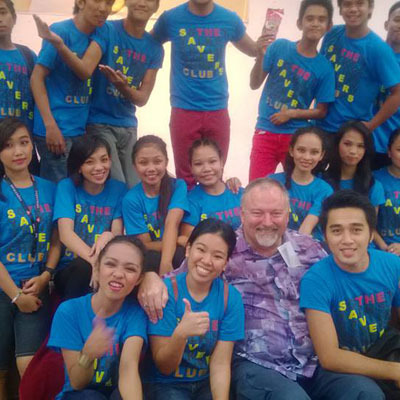 They left Charlotte, North Carolina on the 6th and journeyed halfway around the world, arriving in Manila on the 8th. 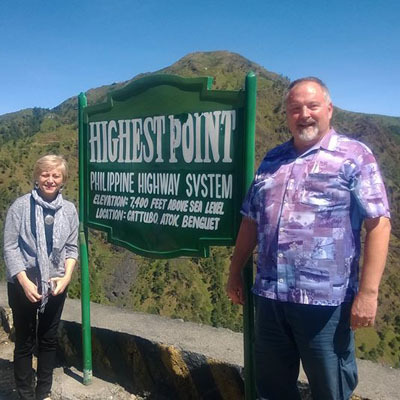 What they did not realize was as their plane approached the Philippines, one of the strongest typhoons ever recorded in history was landing a few hundred miles to the south of them. Super typhoon Haiyan arrived in the Philippines with a vengeance, destroying everything in its path. Nancy, George and Anna continued their mission because the super typhoon was over 300 miles south of them so as not to put them directly in harm’s way. There were also several missionary teams arriving in the typhoon stricken areas to aid the victims. This was positively the perfect time to bring hope and encouragement to each church they ministered in. 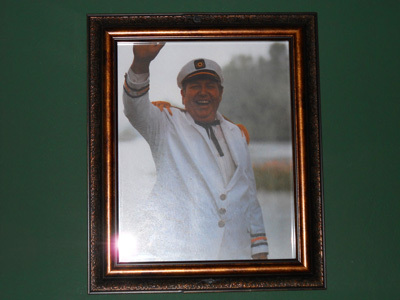 “We arrived in time for the 61st anniversary celebration on Friday the 8th. Pastor Florie, (our host and apostolic leader of the churches we will be visiting) had Jorge, Anna and I greet the people. It was such a joyful celebration. You could feel the joy in the atmosphere. Anna sang “All I Want for Christmas Is You” to the audience. We were warmly received. Jorge spoke in the main church Sunday morning. It was tough ground for some reason, but he broke through for us. I got to speak in the main church with Anna Parrott on Sunday night. Anna had me lay a foundation first then she spoke and brought the house down as she released love into the body. 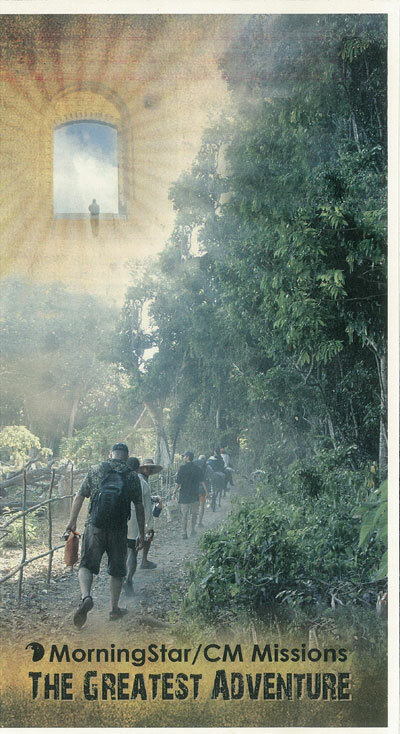 We left on Monday and traveled to the mountain churches. We traveled 7 hours the first day to get to these churches. We were accompanied by several in the ministry. Pastor Florie organized a great trip. We had stops in great places. I am so grateful to Jorge and Anna for making this happen. This was a blessing to me, the pastors who went with us and those we went to see. Jorge and Anna will have many crowns in Heaven. To drive this road is not for the driver weak at heart. The terrain was very difficult but thank God we had a very skilled driver. All day my hands were burning. I kept trying to release the healing to my travel companions but it came back stronger. I inquired of the Lord and He said it was for the nations and showed me that when we got to the next church I should line the altar with people and pray for them. When we arrived, we had a meal that was a sacrifice for them to prepare. We ate outside under a tin roof. My favorite was the greens with rice and small bananas. We spoke in the church that evening. Bear in mind this was Monday night and the church was packed. The people came out to the meeting on a moment’s notice to the small cement building. 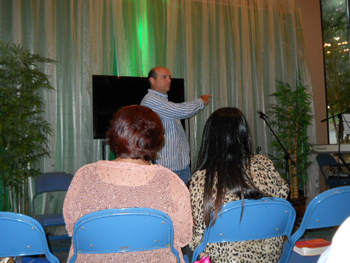 Jorge was first to speak, he broke some things in the Spirit over the city. It was a very powerful meeting as well. Anna was next and sang. The Holy Spirit filled the room. It was powerful! Then it was my turn and I said, ‘Let’s continue in the Spirit.’ I told them when Jorge started speaking I saw a river ankle deep beginning to flow. I saw healing written on the doorway and told everyone. I said that healing is in this house, please come forward for prayer. So they came forward. I heard the Lord say that a vile of healing oil had been broken over the people and told Jorge as we were praying. One of the young pastors stepped up to the mic and said, ‘As Ma’am Nancy came back to pray for the people, she heard the sound of something breaking.’ That was such a great confirmation to me. I did not think about Jorge also breaking powers of darkness until later, so there was altogether much breakthrough going on. We continue to pray for those suffering from the incredible storm south of us. Our mission’s group, CMM, has feet on the ground in the typhoon area. This is over 26 hours driving time from where we are. USA Today reported on the typhoon as follows: “Super typhoon makes landfall in the Philippines.” Super Typhoon Haiyan made landfall early Friday morning in Guiuan, a small city in Samar province in the eastern Philippines. It reached the fragile island chain as the most powerful typhoon or hurricane in recorded history, as based on wind speed measurements from satellites, says meteorologist Jeff Masters of Weather Underground. Below is a slideshow of a few pictures Nancy took on the Mission Trip. On the 28th, Thanksgiving Day, Bishop Ron Lambright’s wife Sue passed away unexpectedly. Sue Lambright was Pastor of Freedom Ministries and a minister at Freedom Christian Center of Fort Mill. She was involved in many ministries and charities such as Ambassadors to the Nations, the Upper Room Chapel, Blessed to be a Blessing Ministries, Samaritan’s Purse and many more. Pastor Sue leaves loving memories to be cherished by her husband: Ron Lambright; two daughters and sons in law: Cherie and Freddy Young of Fort Mill, SC and Michelle and Donald Black of Fort Mill, SC; five grandchildren: Rosie (David) Cohen, Jimmy Grennan, Linda (Brandon) Kott, Nathaniel Black, and Gabriella Black; one great-granddaughter: Skylar Kott and many other loved ones. 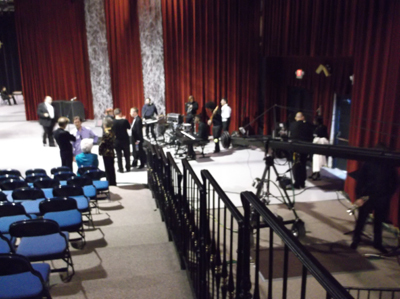 The visitation was held on the evening of December 2nd at the Broadcast Group Complex Studio (former PTL TV Studio) from 5 to 6:30 pm. The funeral immediately followed the visitation from 6:30 to 8:00 pm with Pastor Sue’s husband Bishop Ron Lambright officiating along with words by Reverend Russell James and fellow friends and ministers of the Gospel. Bishop Ron Lambright was one of the original pastors at the Upper Room for the PTL Ministry. Both he and Sue were part of the PTL Ministry and also helped Jim & Tammy Faye Bakker through some difficult times in 1988-89 when they returned to Charlotte, North Carolina. Pastor Lambright currently pastors the Upper Room Chapel. Rick and I knew Sue Lambright as a faithful servant of the Lord with a compassionate heart for broken and disadvantaged people. She was also a fervent prayer warrior! At the end of October, Fox News reported: “Europe storm deaths rise to 15 after 2nd victim in Denmark; tens of thousands without power.” The Europe storm death toll has risen to 15 after Danish police say a driver was killed when he crashed into a tree knocked down by violent gusts. On the 7th, USA Today reported: “Super typhoon makes landfall in the Philippines.” Super Typhoon Haiyan made landfall early Friday morning in Guiuan, a small city in Samar province in the eastern Philippines. On the 8th, the Weekly Standard reported: “Netanyahu: ‘This is a bad deal – a very, very bad deal.’ A very unusual statement from the Israel prime minister on the eve of a possible nuclear detail between the U.S. and Iran. On the 18th, Fox News reported: “Searchers comb through rubble after deadly storm system clobbers Midwest.” Rescuers fanned out across at least a half-dozen states Monday morning in a search for victims, a day after a series of deadly tornadoes and powerful storms tore through the nation’s heartland on Sunday, destroying homes and flipping over cars. On the 24th, the Jerusalem Post reported: “Netanyahu says Iran nuclear deal ‘historic mistake’.” Prime Minister Binyamin Netanyahu characterized the agreement signed with Iran early Sunday morning as a historic mistake. On the 24th, Fox News reported: “Indonesia raises alert level at Sinabung volcano on Sumatra Island to highest.” Indonesian authorities raised the alert status for the country’s most active volcanoes to the highest level Sunday after the mountain repeatedly sent hot clouds of gas down its slope following a series of eruptions in recent days. 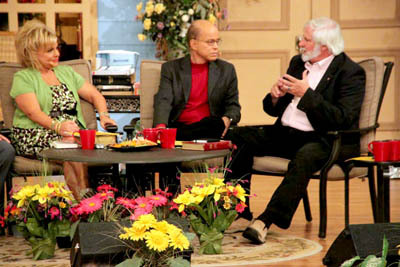 On the 4th- 6th, Rick Joyner’s November visit to the Jim Bakker Show was aired. 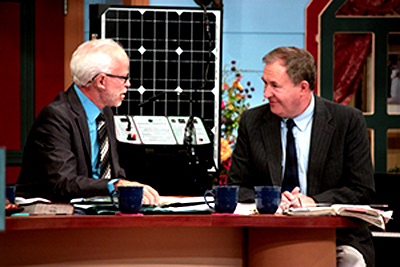 He spent several hours with Pastor Jim, and it took three shows to cover all of their discussions on topics concerning what is happening in the church, the world and to America’s future. During their lengthy conversations, Rick Joyner stated that “time is short” for America, and if we don’t have a revival, a Third Great Awakening, we cannot go any further. He believes that if we don’t put God back on the throne, our money will not be “worth less – it will be worth nothing. No man can fix America’s problems because there is no hope in the natural; only the Lord can help America” Rick Joyner emphatically stated. These interesting shows can be found in the Achieves Section of the Jim Bakker Show; the first show, #2414, aired on December 4th, the second, #2415, on the 5th and the last one, #2416, aired on the 6th. Jim Bakker’s website is: www.jimbakkershow.com. MorningStar Ministries will be holding its annual New Year’s Celebration – 2014 Knowing Your Purpose gathering from December 29th through the 31st. For further information please contact MorningStar Ministries at: www.morningstarministries.org. The guests include, Isaiah Saldivar, Lt. Gen. (Ret.) W.G. Boykin and Rick Joyner. The Towers: Another year has come and gone and there are still no answers as to the fate of the Towers. Rumors swirl but as of now there is no breakthrough on the situation. Once there is a legal battle over anything, it often takes a long, long time to resolve. God’s will be done in this seemingly hopeless drama. 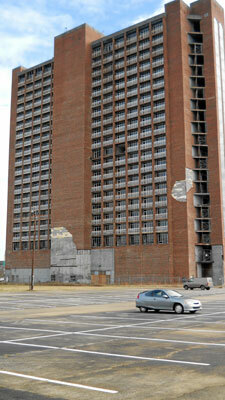 The unfinished Towers has been standing vacant for almost three decades. 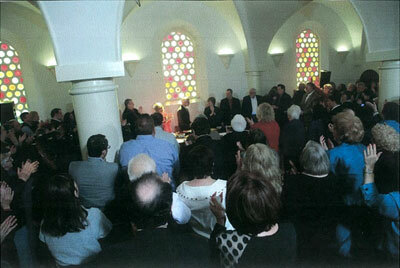 On the 14th, The Upper Room celebrated the third anniversary of its purchase and restoration. 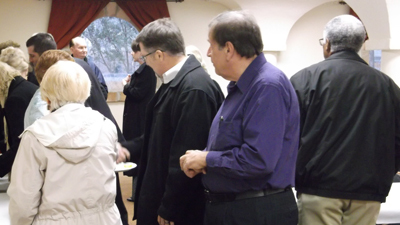 There was a detailed report on the current status of the Upper Room given by Russell James, a message from Pastor Brian Keith, a former PTL Singer, and a special reception afterwards in the lower level of the building. First, Russell gave an account of all the work that was accomplished on the building and grounds this year and his plans for the future. His plans include adding more people to the Prayer Team, being open from 5 p.m. to 9 p.m. each day and eventually 24/7. It will continue to be a community – a House of Unconditional Love. 1. Two beautiful red, white and blue signs were mounted on the sides of the brick column in front of the Upper Room, helping drivers going in either direction to better identify what the building is. 2. 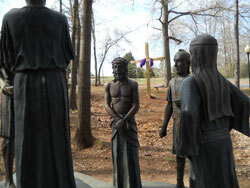 The ground around the life-size statue of Jesus before Pontius Pilate was redone with white marble chips, and several plants were added to the area. 3. Pastor Aubrey Sara’s gravesite has been completely refurbished. 4. 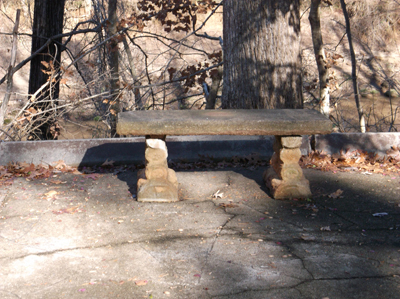 One of the original concrete benches at the Upper Room was recently located and repaired. The bench happened to be the one Russell James used to write down his thoughts when he would visit Heritage USA many years ago. 5. 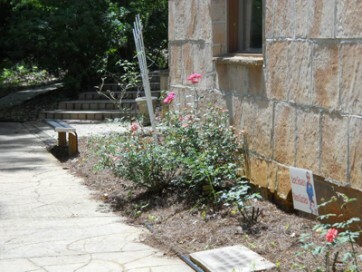 Aunt Susan’s Rose Garden now has 28 rose bushes in it. There was also the tedious job of resurfacing the roof, and many trees were trimmed back by a crew that Russell found favor with. One of the larger trees that could have caused damage to the building was completely removed. 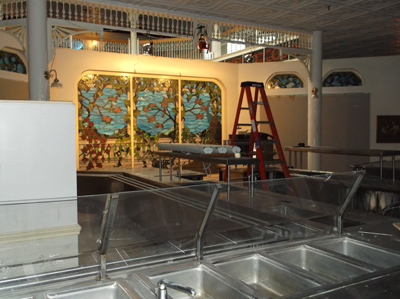 Leaks are being fixed and there is continual work being done to upkeep the building. 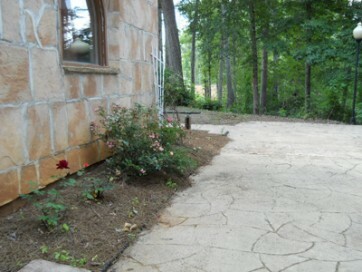 In the spring, all the walkways will be washed with the Upper Room’s new pressure washer which was an anonymous gift. 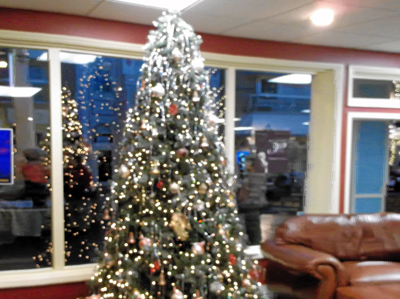 Russell also stated that the total of the 2013 donations to the Upper Room was $12,270. Additionally, there was an unexpected donation made by Morningside Ministries in Blue Eye, Missouri for the same amount! God’s hand is certainly on Russell. This is a humble man who has given up everything to continue the work of ministering to people in the Upper Room. God Bless him and his entire family one hundred fold now and in the coming year. The next part of the service was conducted by Pastor Brian Keith. Pastor Keith told how he came to PTL in 1984 as a very young man and was privileged to be a part of the PTL Ministry. He shared how he went through the heartache of watching PTL collapse, but he went on to experience the Lord’s unfailing faithfulness in directing his life and is now the Pastor of Faith Assembly Church in Rock Hill, South Carolina. Pastor Keith’s timely message was an encouragement to keep walking with God. He said there will be a “defining singular moment” in a person’s life revealing his purpose to change the world he or she lives in. He referenced Abraham Lincoln’s Gettysburg Address, “The Catch” in a San Francisco 49ers’ major football game in the late 80’s that changed their losing streak, leading them to a Super Bowl victory. He pointed out the beautiful Esther in the Old Testament who had her “defining singular moment” when she stood up to her husband King Xerxes, who reigned over 127 provinces stretching from India to Ethiopia, on behalf of her people and saved the Jewish population from being destroyed. It was a good message for such a time as this. 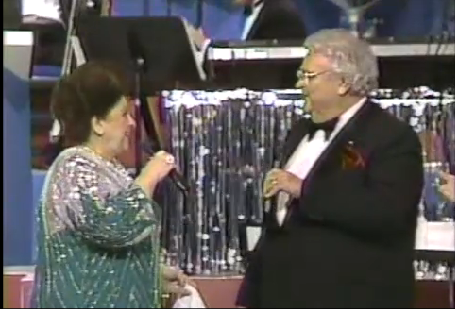 A look back ~ A timeless video of the Bakker Family at their last celebration at Heritage USA on New Year’s Eve 1986 – just three months before Jim Bakker resigned. The video is 57 minutes long and the first few minutes are jumpy. Can you believe that 2013 is coming to an end? So much changed this year on the grounds and in the world that it would be worth looking over the Time Line. We will leave 2013 up for a while before we transfer it to the Achieves. God Bless you in the coming New Year with a peace that passes understanding, the joy of knowing that the Lord is always in control and the courage to live out your convictions. May you find comfort in our great God and Savior Jesus Christ who supplies all our needs according to His riches in Heaven. We also want to take this time to Thank You so very much for visiting our Website. God willing, we will be back in 2014 with January’s Update. We pray for you to have a peace-filled Christmas filled with hope in your heart. This is the prayer of Habakkuk the prophet, on shigionoth. Lord, I have heard the news about you; I am amazed at what you have done. Lord, do great things once again in our time; make those things happen again in our own days. Even when you are angry, remember to be kind.